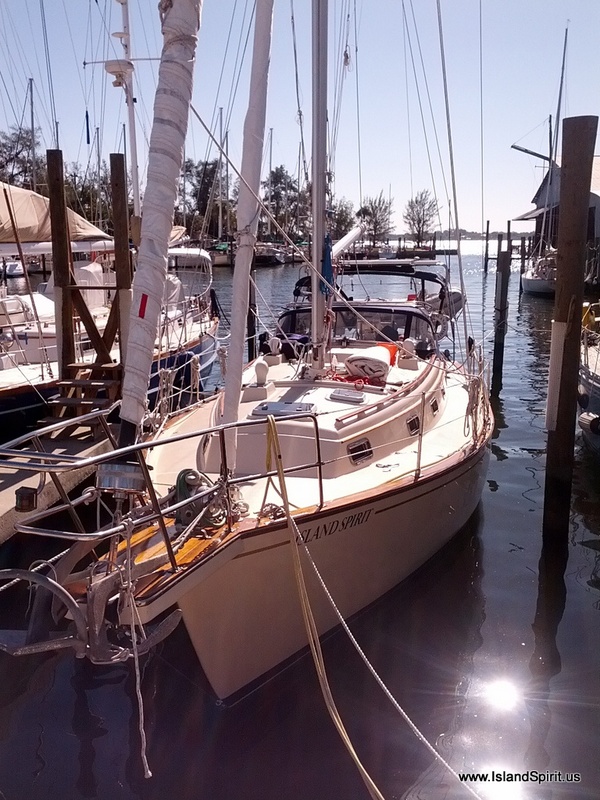 Cruising Year #3 begins at Palmetto, Florida…..
We have said this many times before, but the hardest part of ANY voyage is actually leaving the dock. This sounds crazy, but it is so true. 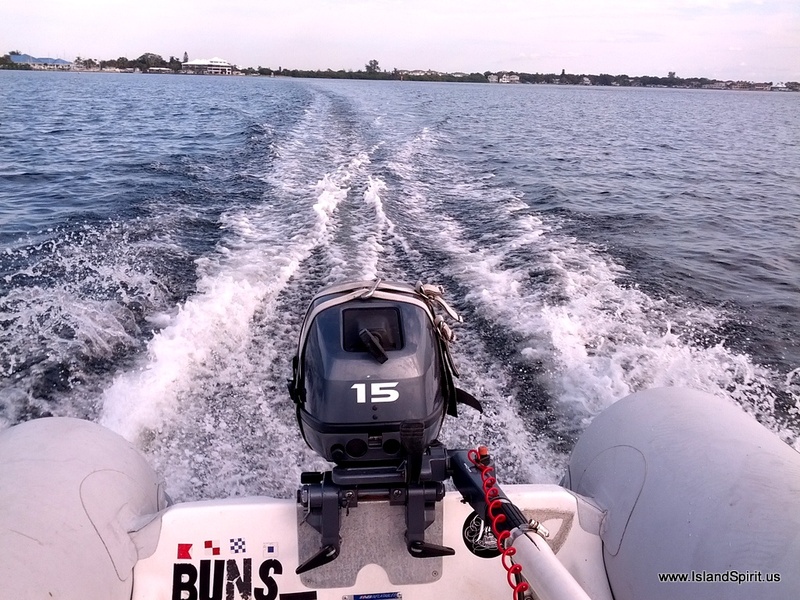 With a car and the comforts of the dock and the safety of shore, leaving is never easy, and we have done this for over 10 years! It is still hard to do. Then, once you leave and get underway, you are relieved at the peace and comfort of being “away.” No more driving a car, no more frantic shopping and consuming, no more noise, dust and dirt. 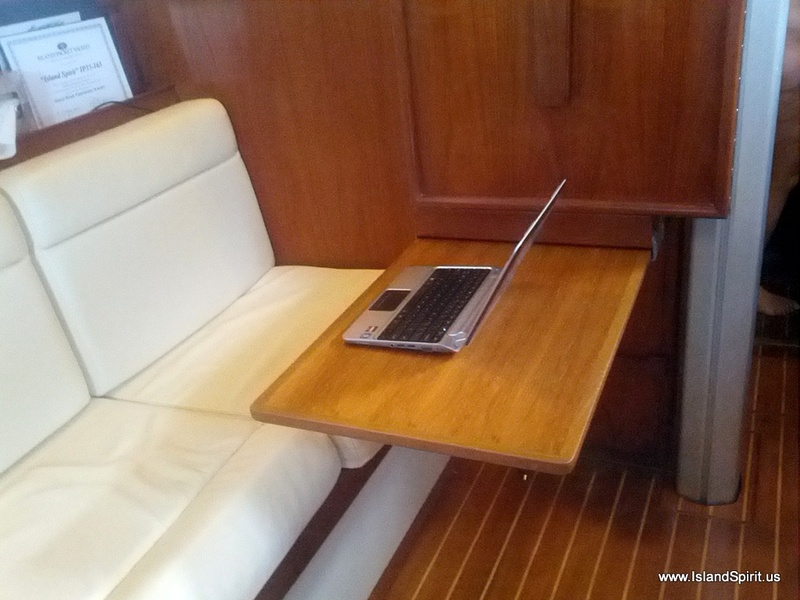 Just simple living on a sailboat, off 12 volt power and your own supplies. Once out and away from the docks, the cruising life slowly presents the beauty of the dream. 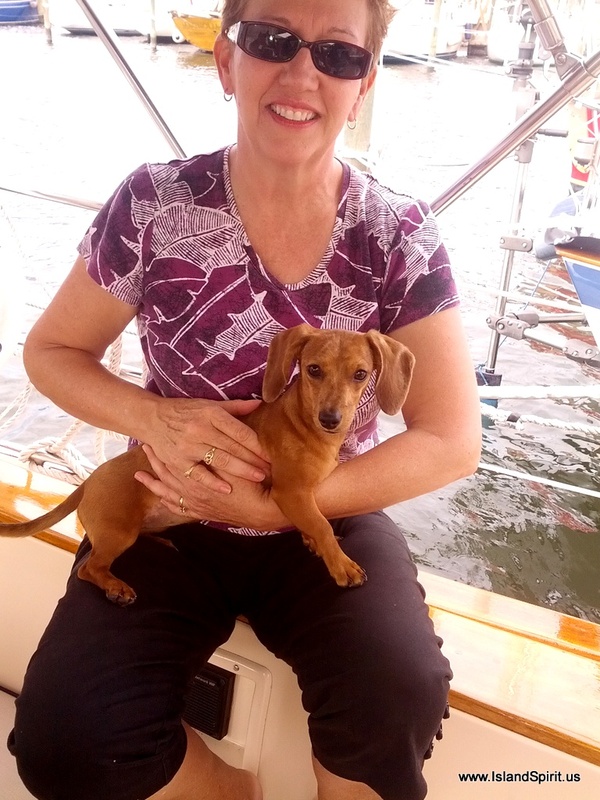 Dolphins swam with us at Longboat Key and looked up at our boat as if to say…About Time You Get Out Here….seagulls and pelicans soared by taking notice as we motored on Tampa Bay. 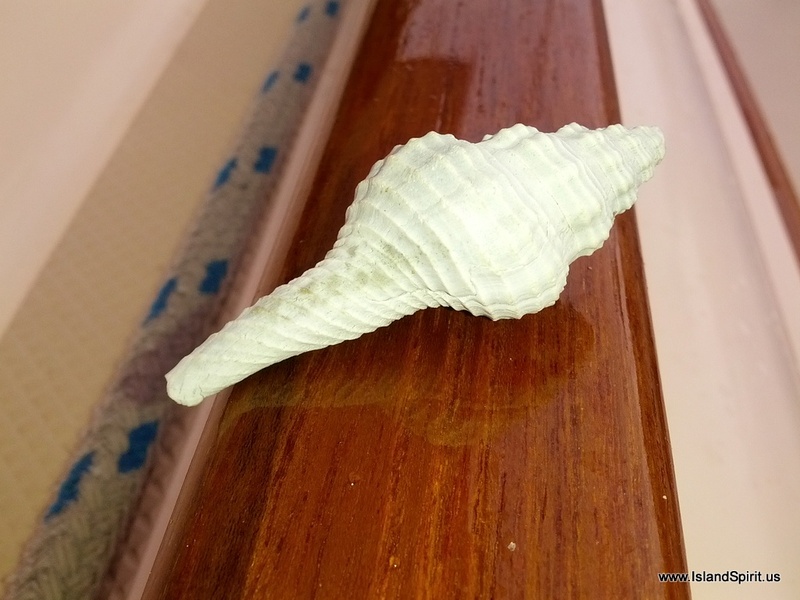 What a beautiful world it is out here and these are some of the reasons we worked so hard getting our boat refit, was so we could return to this cruising lifestyle. 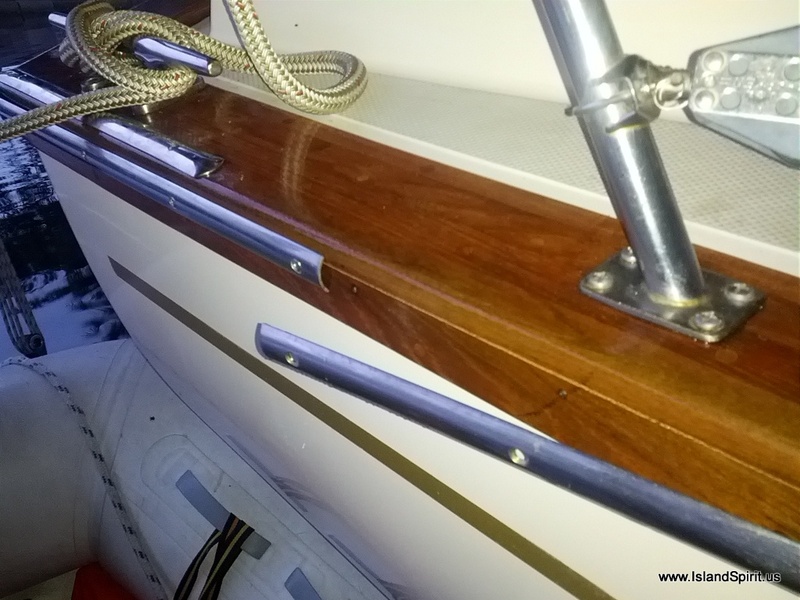 No, we really did not “need to” do the refit, but as with all boating upgrades, it was fun and exciting to work out. So we did it and we are glad we did. This 20 year old boat is running better than ever and feels like new to us. 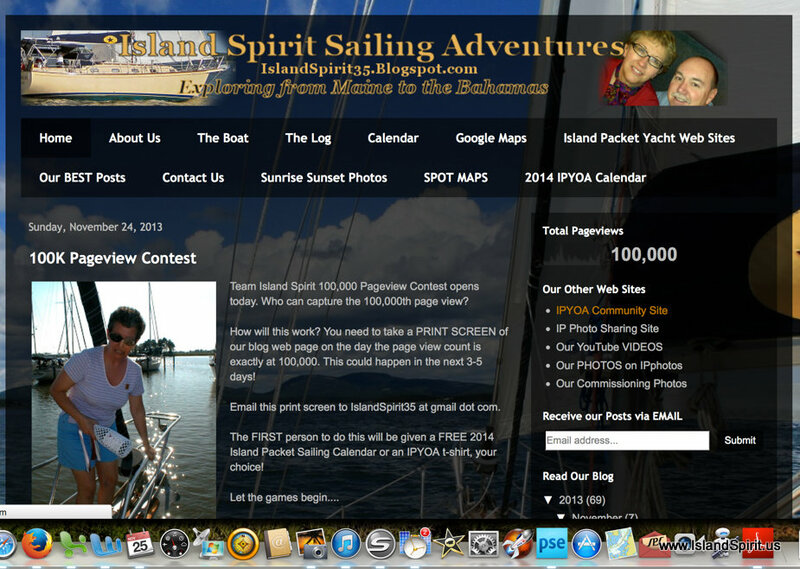 Great job, Island Packet Yachts! 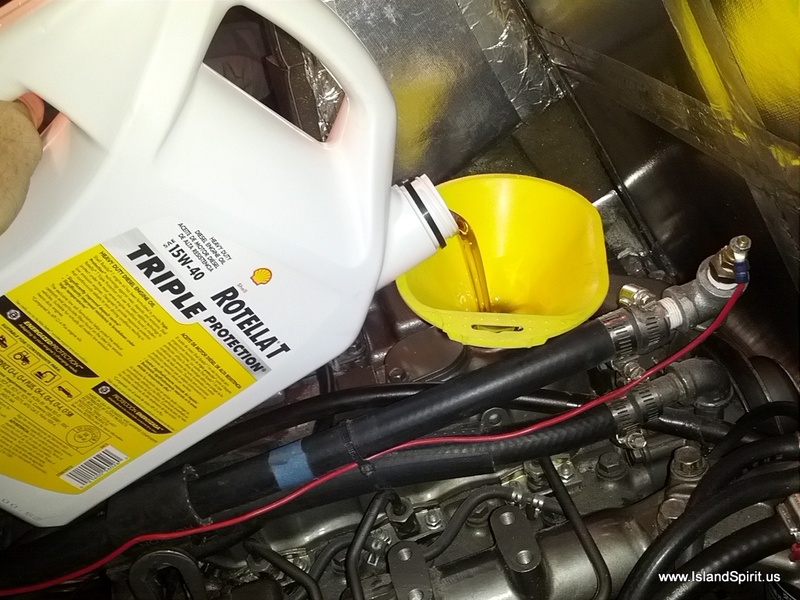 Valve Adjustment 2 hours before departure….why not? The days leading up to departure are always crazy. Shopping for items you think you need. 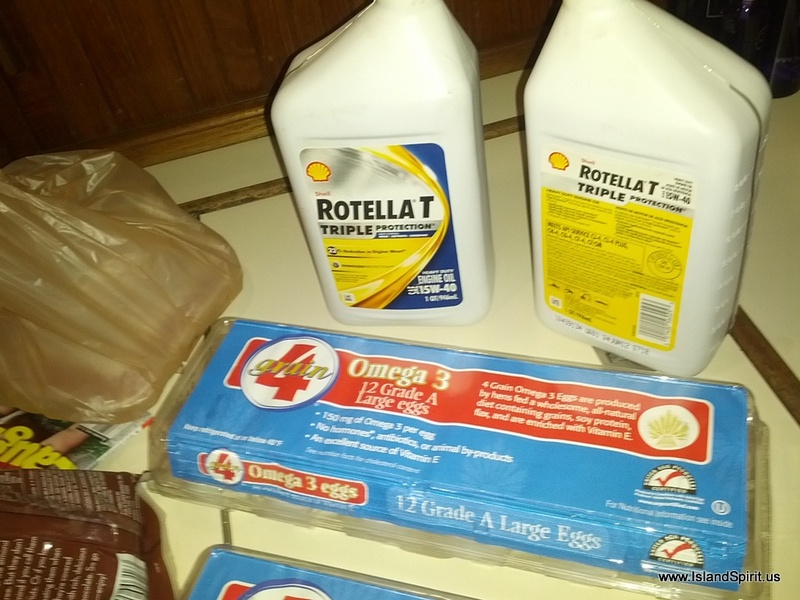 Shopping for items you think you will need for the next month or two. Imagine shopping for a month. What would YOU buy? 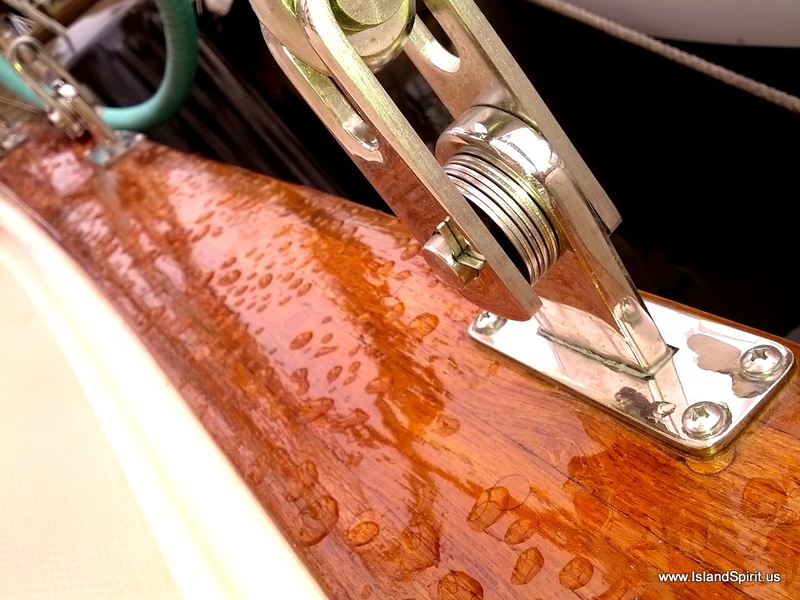 Prep the boat: Remove the water hose, electric cords, sun shade, extra dock lines, fenders and gear. Stow all items bought and brought on board. 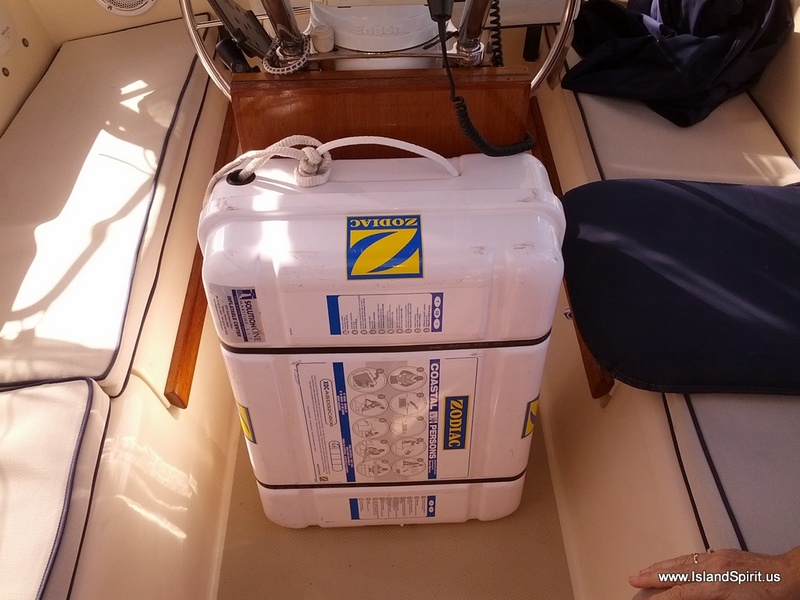 Change the fuel filters, check the sea strainer, check the bilges, engine fluids, etc. Find the life jackets, safety harness, EPIRB, radios, and safety gear. Update your float plans, and emergency contacts and SPOT transmitter. 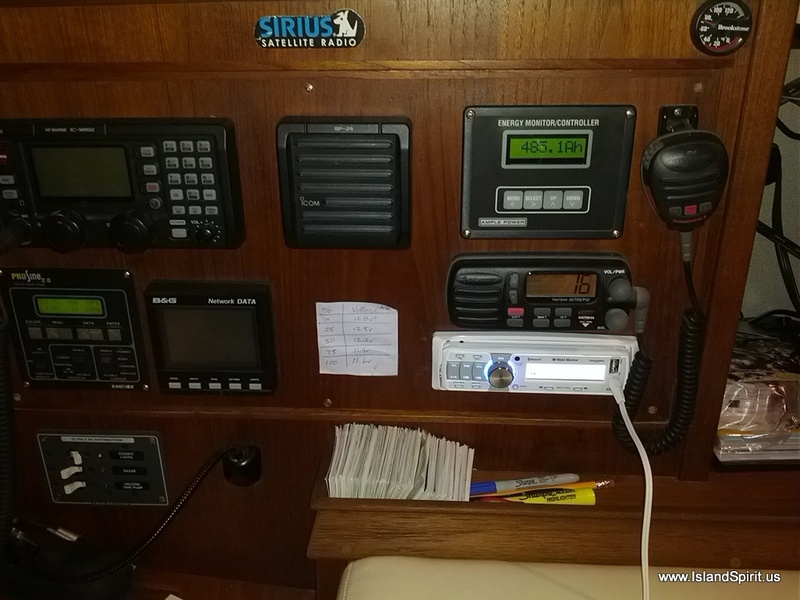 Check the 12 volt network and all antennas and communications. On and on and on until you finally say, that is enough….WE ARE LEAVING ….on…..Monday at noon. Then when noon Monday rolled around we were still frantically working, and we simply said, let’t go. We parked the car, stowed the keys, fired up the diesel and tossed off the dock lines. 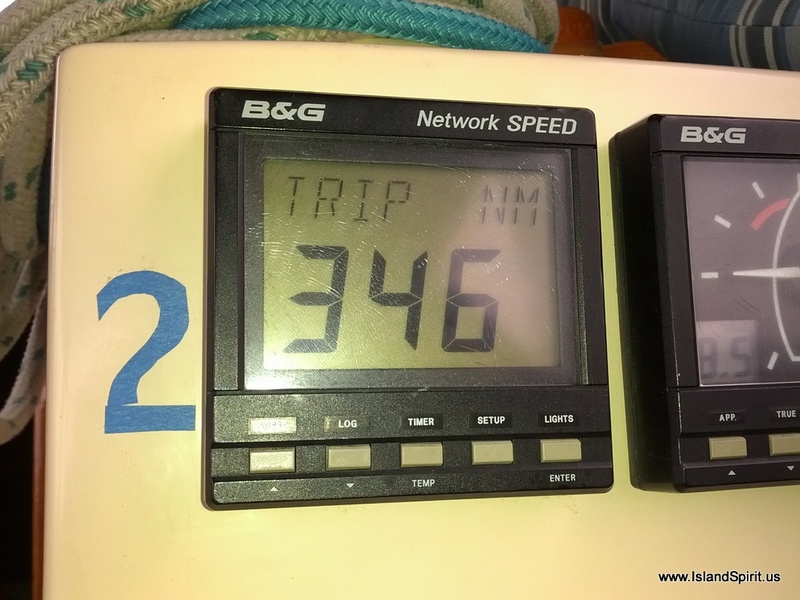 25 NM later and filled up with fuel, we dropped the anchor in Sarasota Bay. Our Okeechobee Challenge #2 begins now. We will return back across the center of Florida and we will lean our 49’8″ mast under the 49′ 4″ Port Mayaca Railroad Bridge, allowing us to make Stuart, Florida in 5-6 days. We plan to has Colin Mack of www.MackSails.com do some final rigging for us to complete our refit. So, let year #3 of cruising begin. 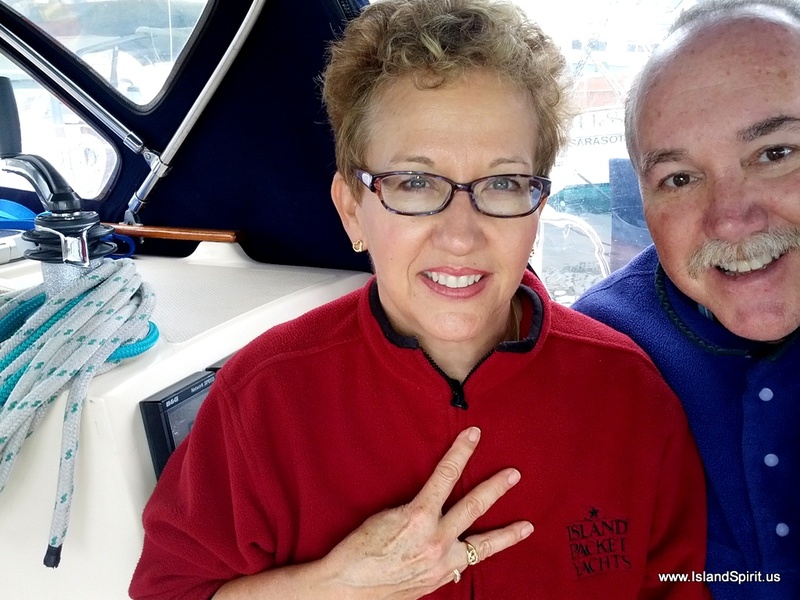 Our goals are to return to the Bahamas and to get back to Block Island, RI, for the summer. That is the big plan for 2013-2014. Thanks for sailing along. 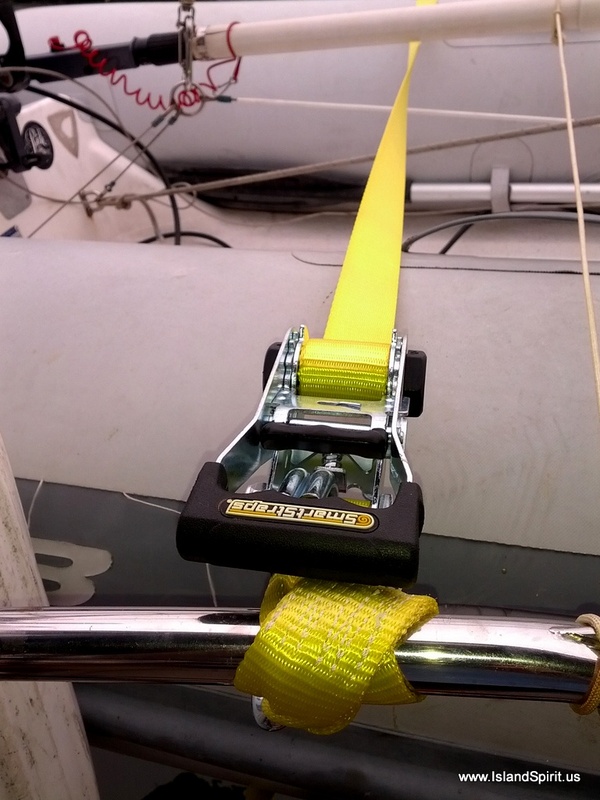 WILD and BRIGHT yellow dinghy straps. This looks sooooo cool ? So, off we go heading to Lake Okeechobee for the challenge of sqeezing under that darn 49.3′ bridge. Let’s hope we can lean over enough to make it through again. Stuart, Florida, here we come! 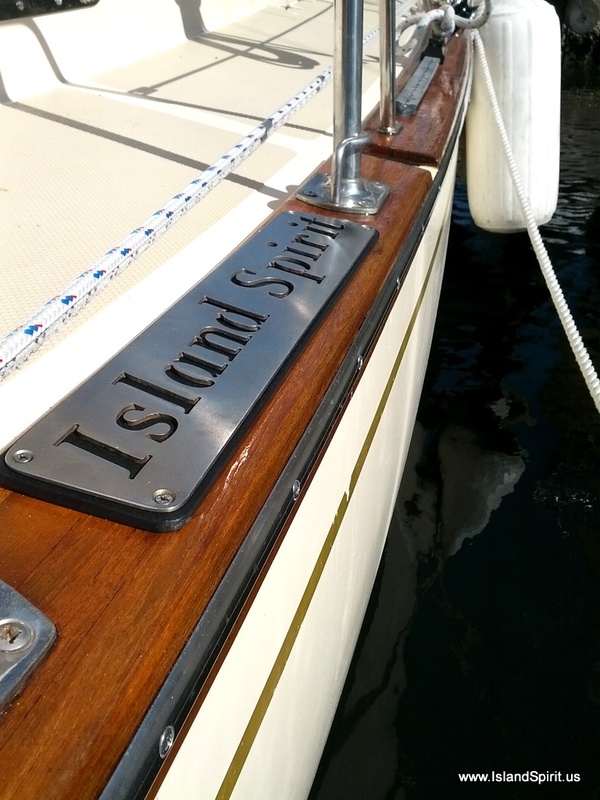 On December 24, 2013 after nearly two months of re-building, we connected the last wire and then installed the custom Island Spirit step plates, completing the refit of our 20 year old yacht. What a job. 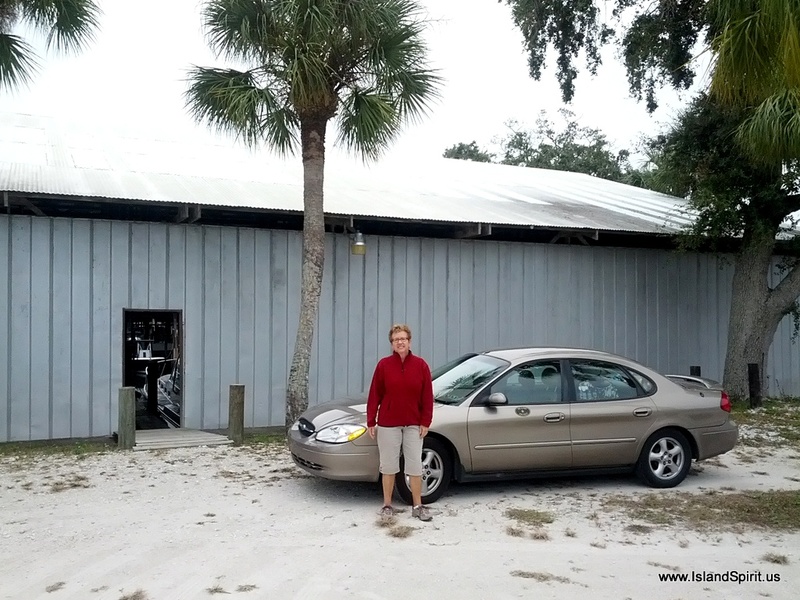 Back in May, we pulled into Snead Island Boat Works, in Palmetto, Fl, and took our boat apart. 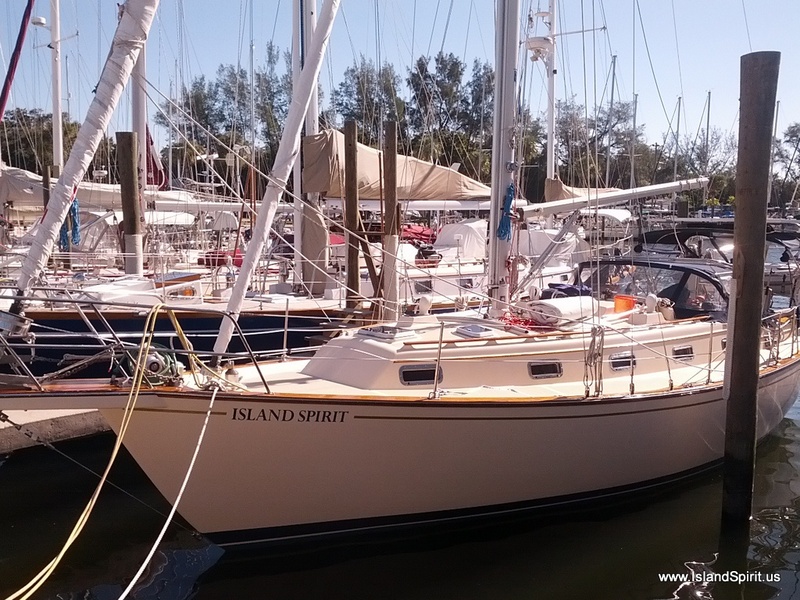 We hauled it out and truckled it to the Island Packet Yachts factory where she was built in 1993. From May to November, she was inside the factory and the skilled employees at IPY rebuilt systems back to new conditions. Then on November 4, we trucked the boat back to Snead Island Boat Works where we re-launched and then began the re-assembly of all systems we removed for trucking. I must say that the rebuilding of systems took far more effort then the tearing down of those systems. It actually took us nearly two months to rebuild, but only about 2 weeks to tear it all down. 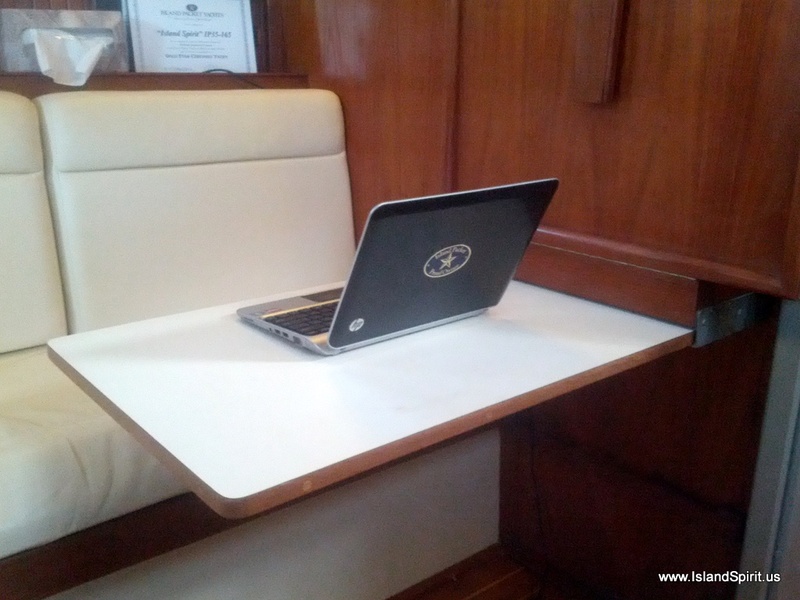 While the boat was at the Island Packet Yachts factory, we focused on seaworthiness items and making the yacht better. 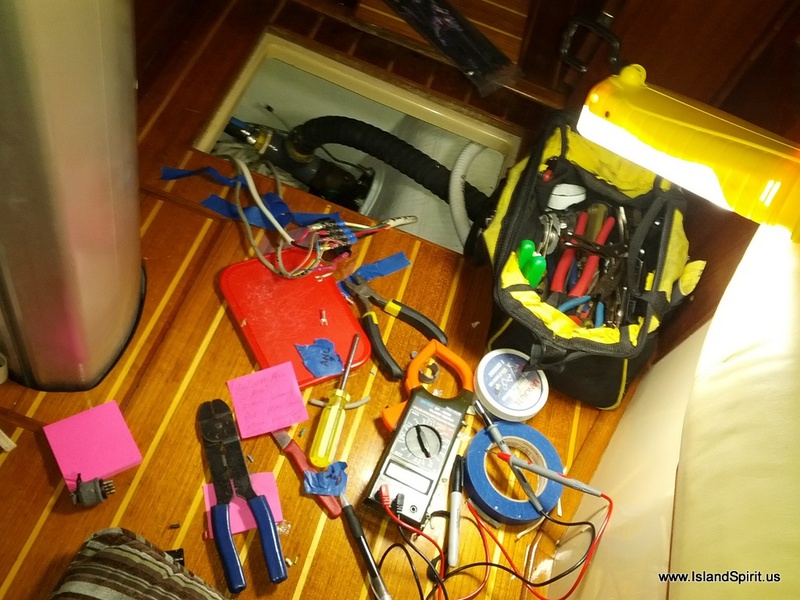 We looked at any system that could sink the yacht and had that system taken apart and rebuilt. Now we are feeling as if we have a brand new yacht and we know exactly what was rebuilt and who rebuilt it. 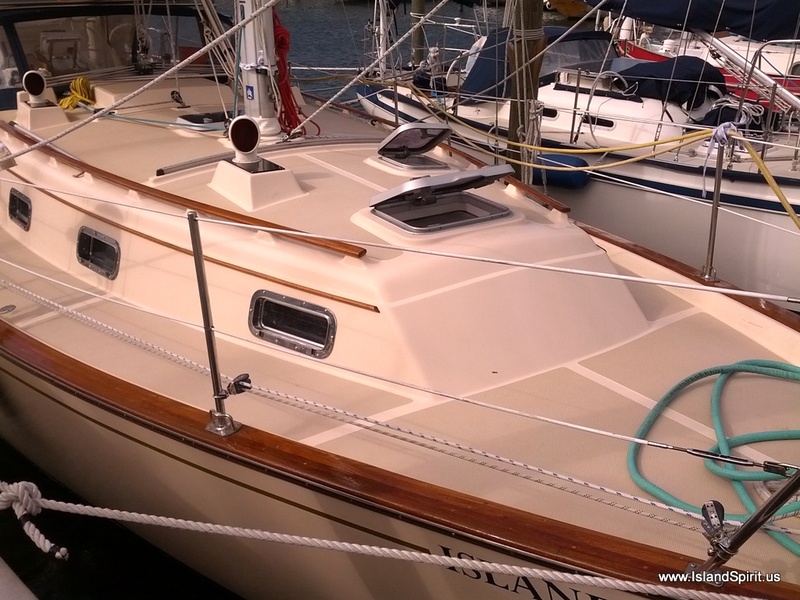 The work by Island Packet was excellent and I highly recommend them for any and all refit work on their yachts. I am convinced there is no better team. I am a list person, so please allow me to progress through the order of work to explain the extent of this task. Simple as 1, 2 3 ! 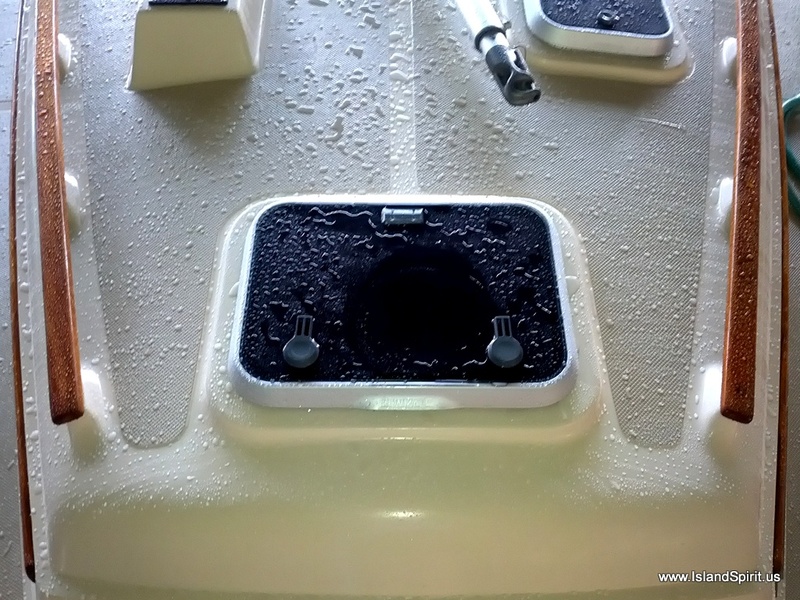 Empty bow lockers, bilge locker, hanging lockers, etc. Empty the boat! Box it all up, move it all to a storage facility via rental car! 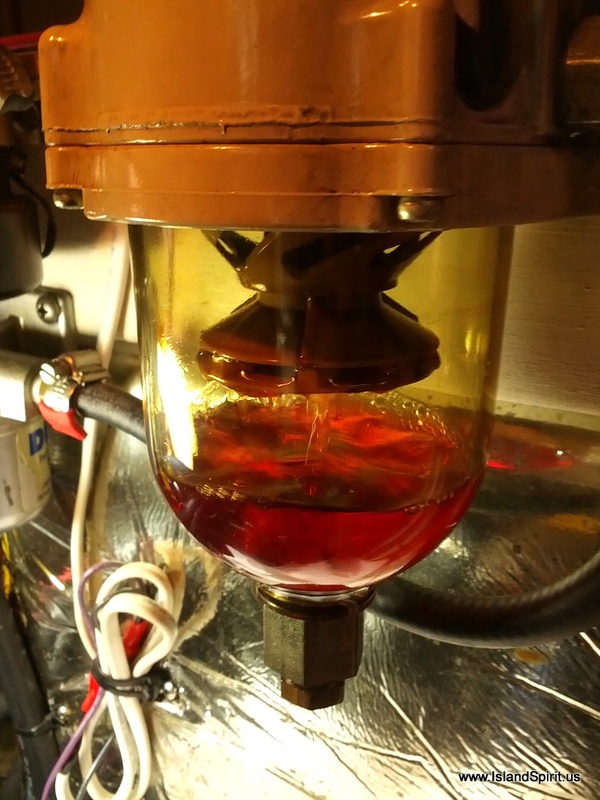 Rebuild the sump pumps and add new hoses and new anti-siphons. 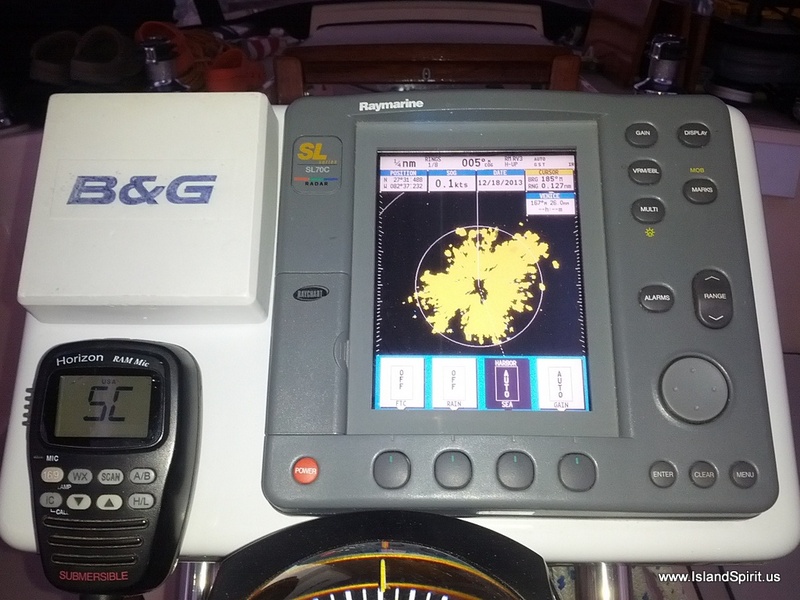 Test all systems: Radar, AIS, GPS, NMEA bus, VHF, TV, Running Lights, Mast Lights, Navigation Computer with AIS feed and Satellite Radio feed. We are relieved to have the boat put back together at last. With a single list like this, it does not look that bad, but believe me, this was a ton of work, time and expense. Some days we were selling the boat, then other days we were incredibly happy. Sometimes, it was a real challenge to stay motivated. So, let our third year of cruising officially begin now. 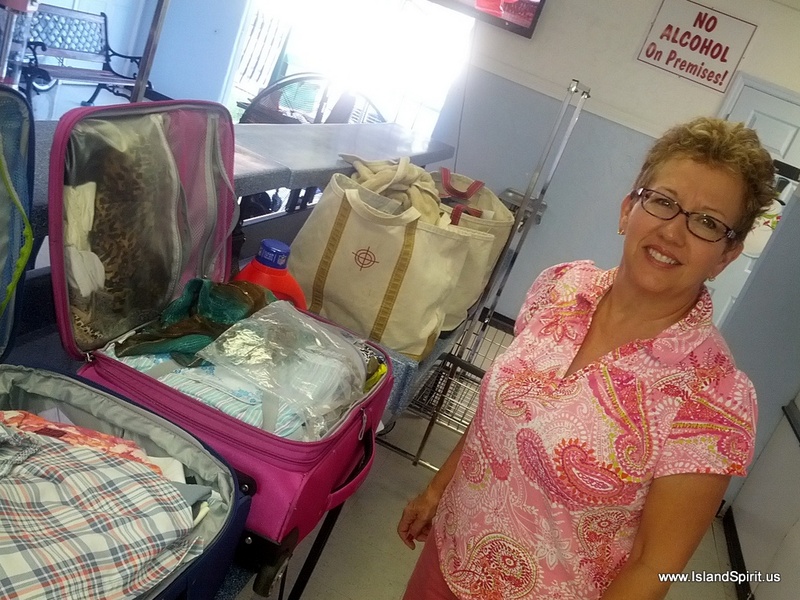 We can start to provision and load up for our third trip to the Bahamas. 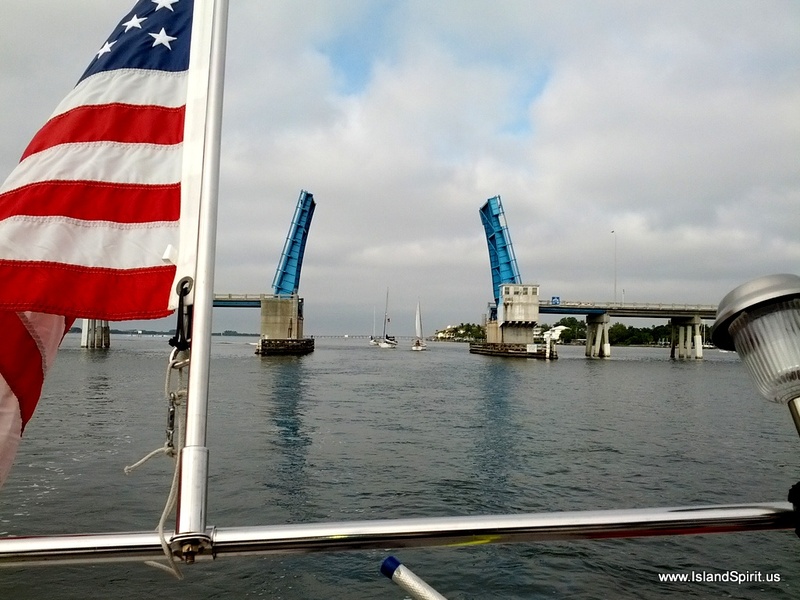 We will need to sail from Tampa Bay down and around the Florida Keys and up to Biscayne Bay, Miami, or challenge the Okeechobee Waterway once again and that 49 foot railroad bridge. We want to spend January in Biscayne Bay and some of February, too. Then as weather allows, we will head out for the Bahamas for three months. Thank you for sailing along with us! The mast went in but the next day the crane returned and we removed the staysail rig and had it taken apart to re-cut. It was too long and provided zero adjustment when the new rig stretches. So, they cut 1 1/4″ off the inner stay, making it better. 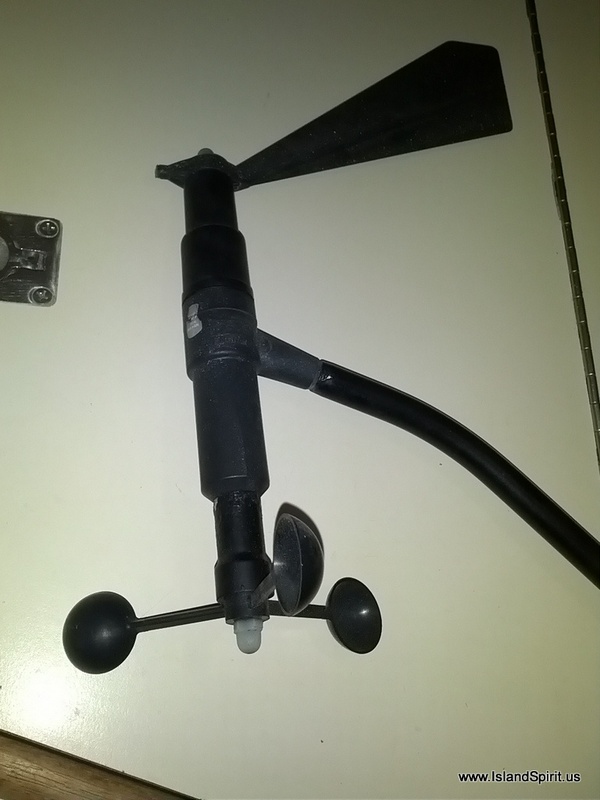 This required me to pull the cotter pins and loosen the rig and remove the sail once again. 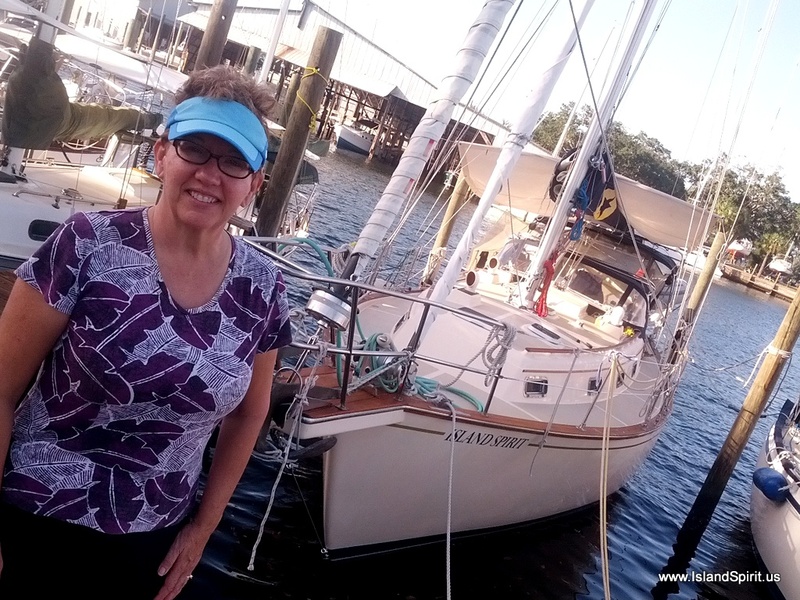 After the inner stay was re-installed, I re-tuned the rig to factory specs and re-installed the sail. Radeen the Christmas Elf has been busy making cookies and Christmas Fudge. 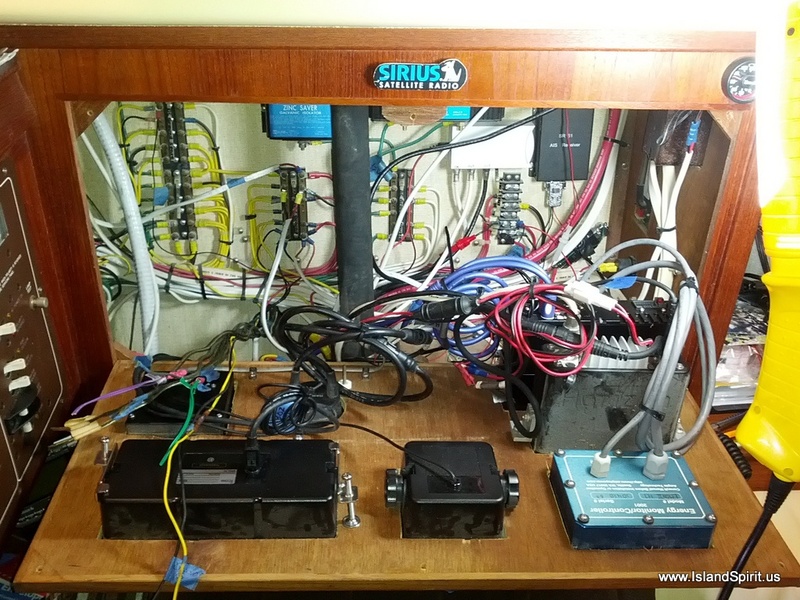 I am busy finishing up the single side band radio re-install and improving the mast base wiring. Overall the rebuilding has been a long process and I am not sure why, but it just has been a very long drawn out process. Everyday there has been something to re-install, re-wire, re-connect, test, fix, or improve. It has been far more work than we expected, but how often do you tear apart a perfectly working cruising yacht and then rebuild it. Not very often, and now we know why! 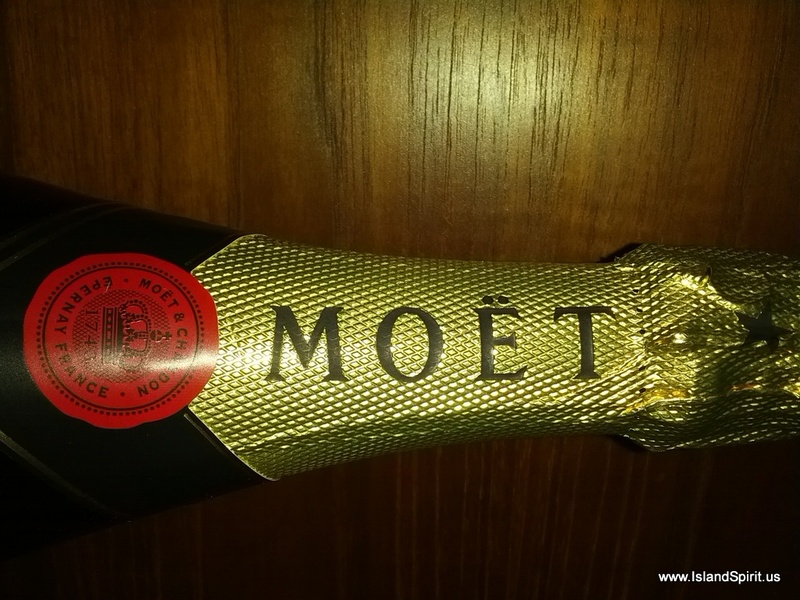 Here are some random photos of the “scene”…..Merry Christmas….. The local Heron says….WHAT? That crane was just there? 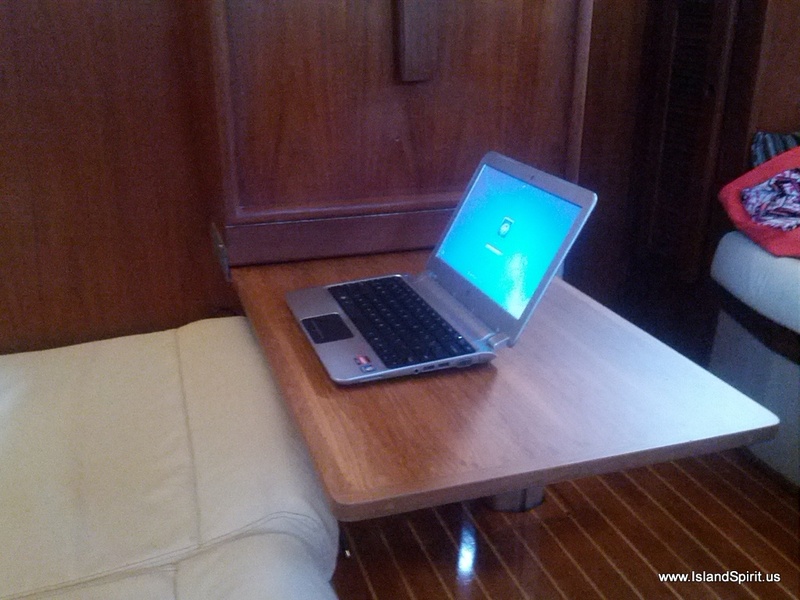 Laptop desk teak side, we had the IPY Factory make a new one. 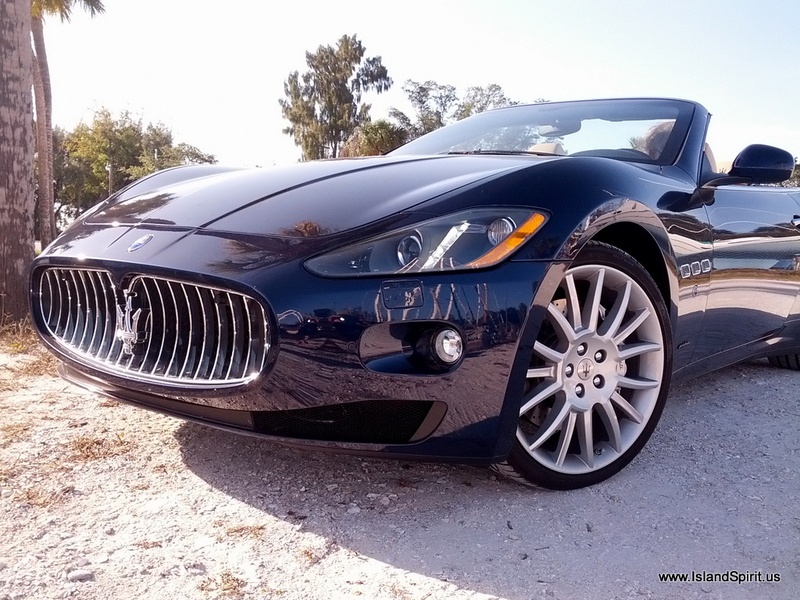 My New Car….Merry Christmas to US…its only money! Seven weeks after re-launching, we have finally re-installed the mast as Island Spirit progresses through her refit. Our good friend, Carey, gave us a Silver Sand Dollar that belonged to his wife, Bobbi. We placed it under our mast along with a good luck penny from the Bahamas. With these two treasures under our mast, we are sure Island Spirit will enjoy many more years of ocean sailing and happy adventures. Thank you Carey for providing us with such a treasure to secure under our mast. You are a dear friend! 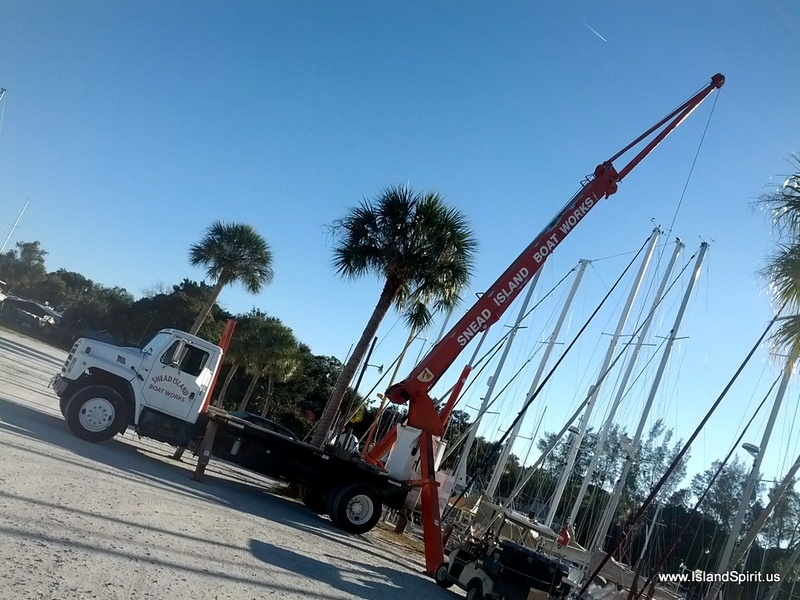 Installing a mast requires a crane operator to lift the 50 foot mast and all the rigging off the parking lot and out over the boat. With skill and experience, along with several people on the deck and down below, the crane operator lowers the mast into the deck and down into the keel. Below deck, with the mast a few feet off the keel, wires need to be pulled out of the bottom of the mast and fed through a small hole in the side of the mast. 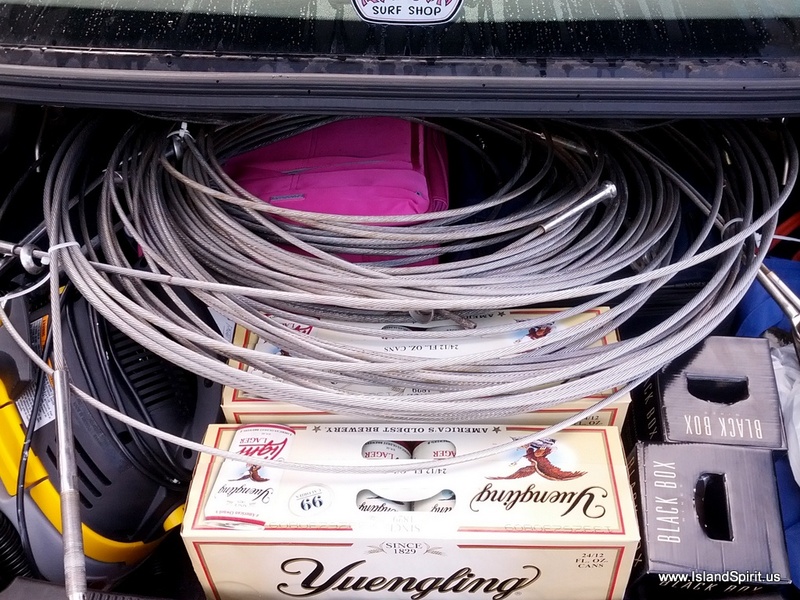 These wires are for radar, wind instrument, lights, etc. 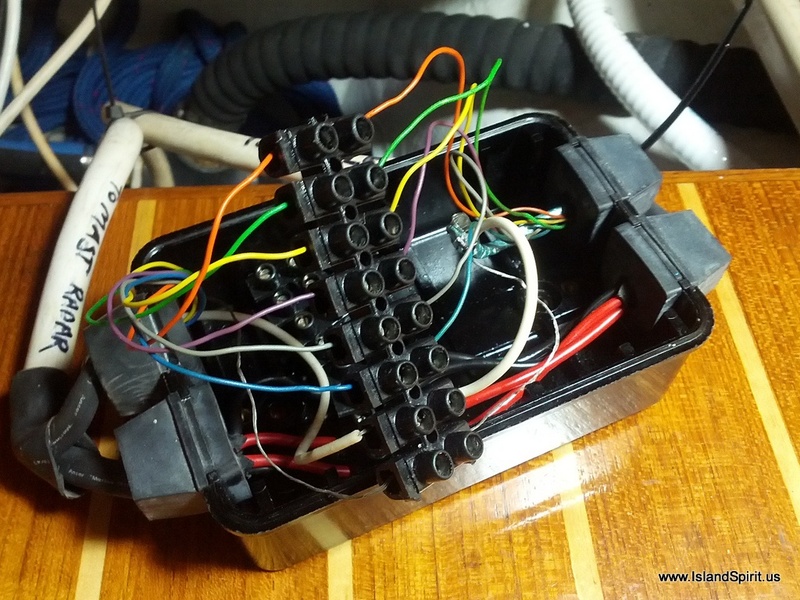 and need to be reconnected into the ship’s wiring. Once the wires are led, the crane operator can then lower the mast down onto the mast base which fits over a matched raised base fitting. 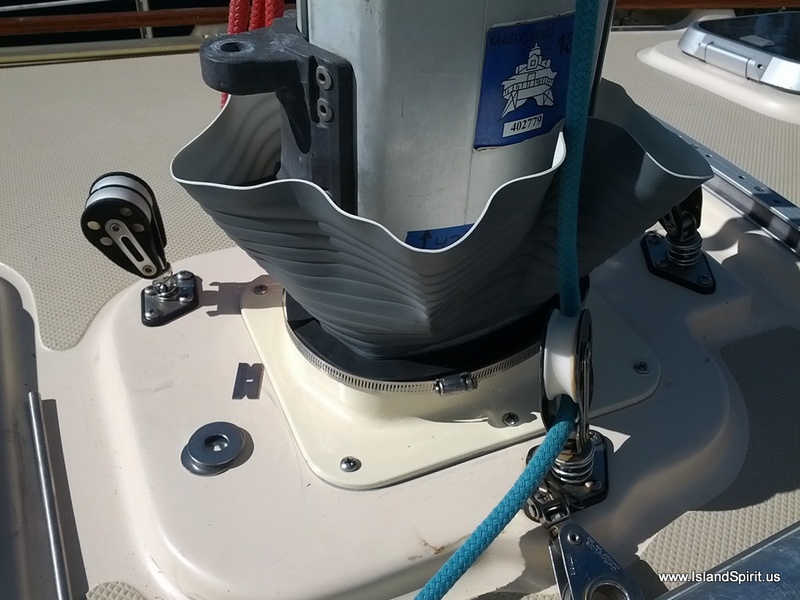 It is under here that our special tokens were placed and will remain as we enjoy the next decade of sailing. 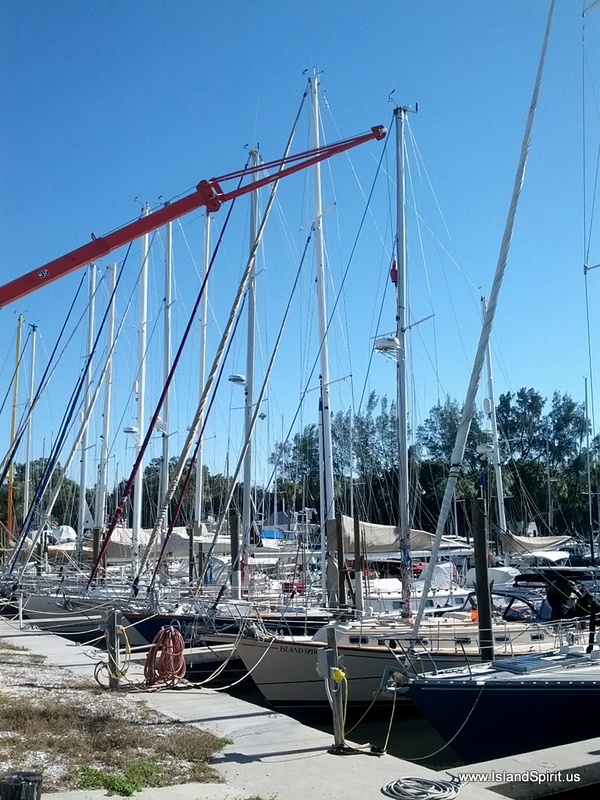 Stepping a mast is a big deal in the life of boat ownership. It is always exciting. Once the mast in installed, the crane is removed and the new standing rigging wires are connected to the chain plates at the sides, the bow and the stern. These wires are tightened using turnbuckles as the rig is tuned to proper design loads. 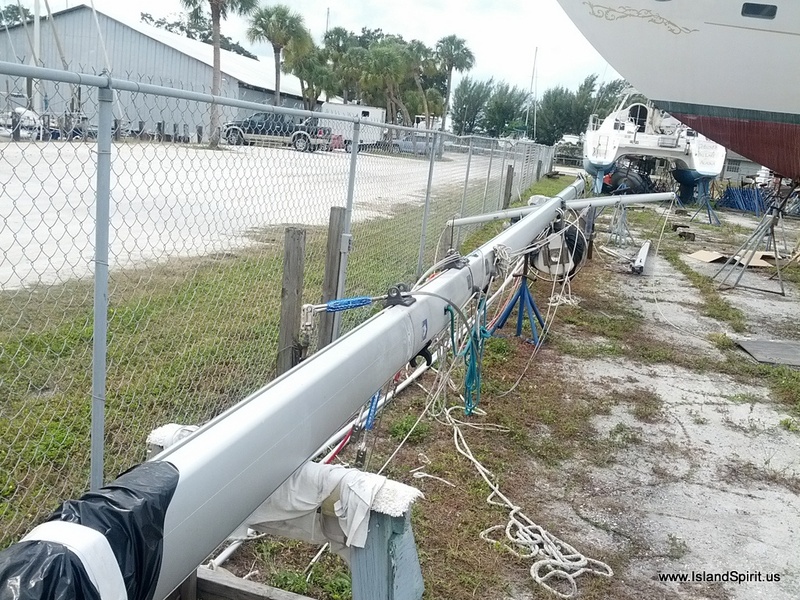 After the rig is tuned, the sails can be installed and the wiring at the base of the mast re-connected. This is the first time our rig has been removed since we first commissioned this boat in 2002. Now it is time to shake down and test out all systems onboard. Soon, very soon, we should be ready to begin cruising again. Carey and Hayden on the river to test the motor…running great! 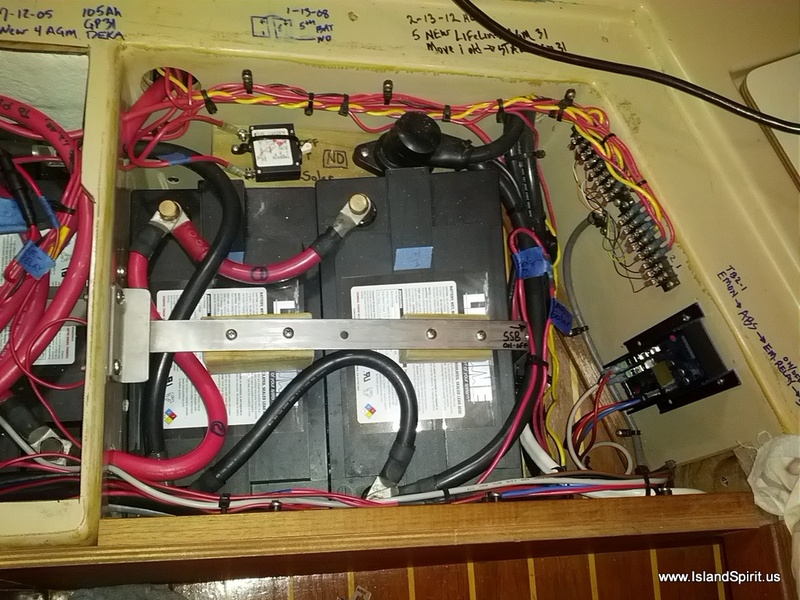 Wiring at the base of the mast for the B&G wind instrument which steers the boat. Old and new standard sheaves. The halyards run through these to raise the sails. 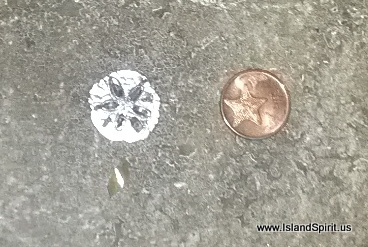 Our good luck items, Bobbi’s Silver Sand Dollar and a Bahamian penny. Two Sails installed, one more to go! Hot, Sunny Florida, 75 degrees, NICE! 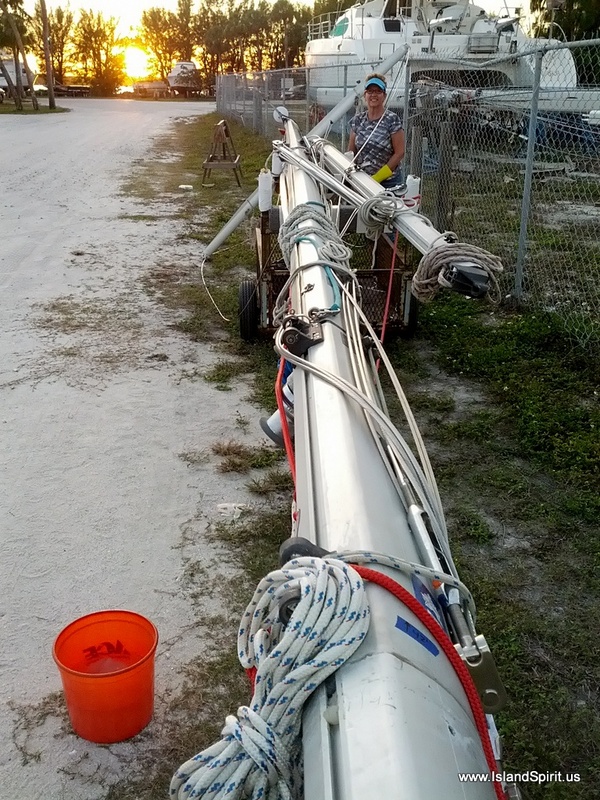 Our 50 foot mast in the boat yard…. We are enjoying our time here at Snead Island Boatworks as we continue to upgrade and rebuild our 20 year old Island Packet 35. 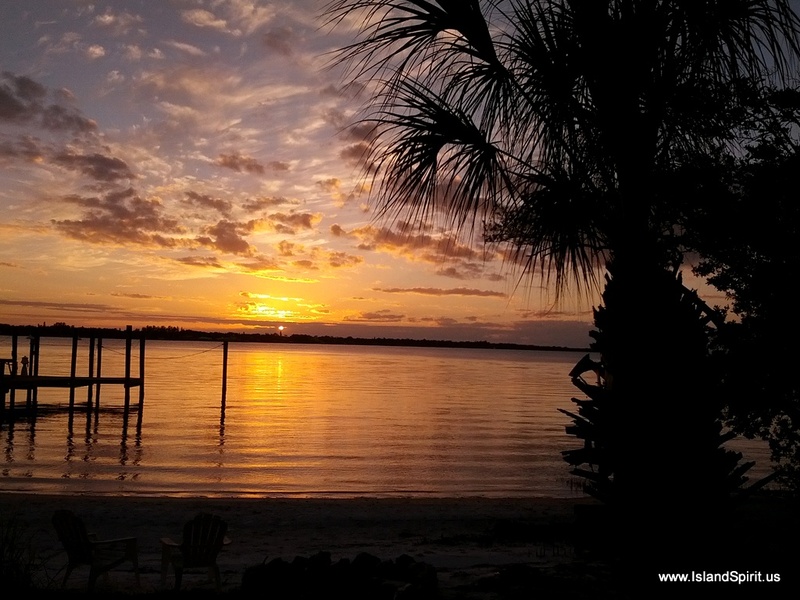 The Palemtto, Bradenton, Sarasota Florida area is fantastic and we are in no hurry to move out of here. So, we simply are enjoying the peaceful rebuild and visiting with good friends Craig and Debbie who live in Bradenton. They have returned from their USA tour , last week, and we have been visiting with them and sharing meals together and watching movies. Craig mounted a 60″ TV on the wall and we are being spoiled by the comfort of a beautiful Flordia Condo. With our mast in the yard, we have no TV antenna, no satellite radio reception (in the barn), no AM/FM antenna, zippo. So our only comms are Interenet via our cell phones and network. 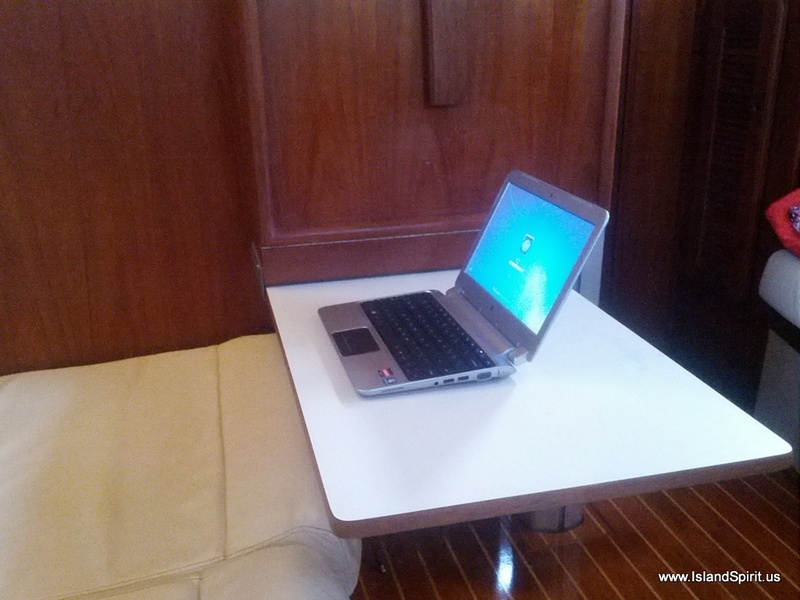 Imagine, no TV, radio for two months. Try it, you will NOT miss it! We enjoyed watching the Bradenton Yacht Club lighted boat parade where our Island Packet Friends, William and Judy and their family entered their IP37 Optimystique into the parade. What a great time with many boats fully decorated and well lit. Each boat paraded by the yacht club, one at a time, with the crowd cheering them on in the 20 knot winds! After the parade there was a cocktail party and buffet followed by fireworks. What a great yacht club. One more reason to enjoy this area. 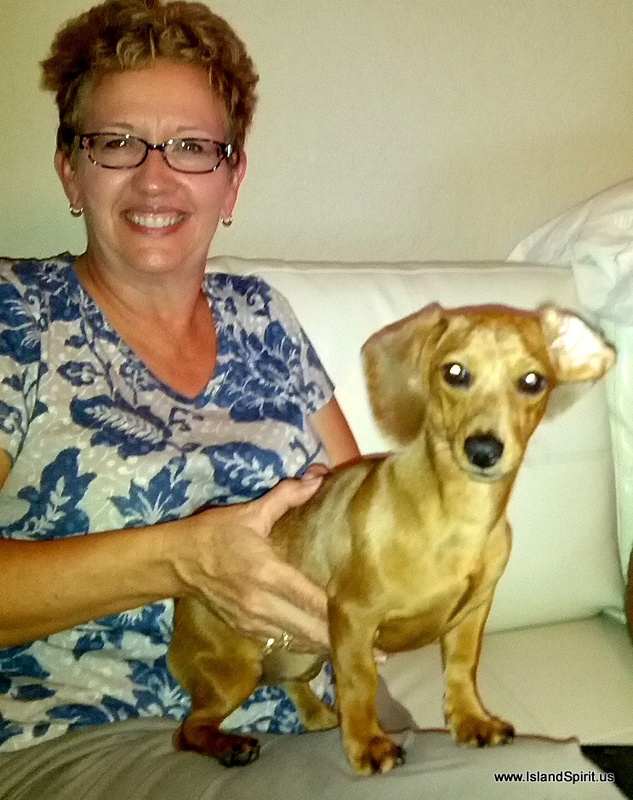 Radeen may be turning into a dog lover as she has really enjoyed HOLLY, the pet of Debbie and Craig. 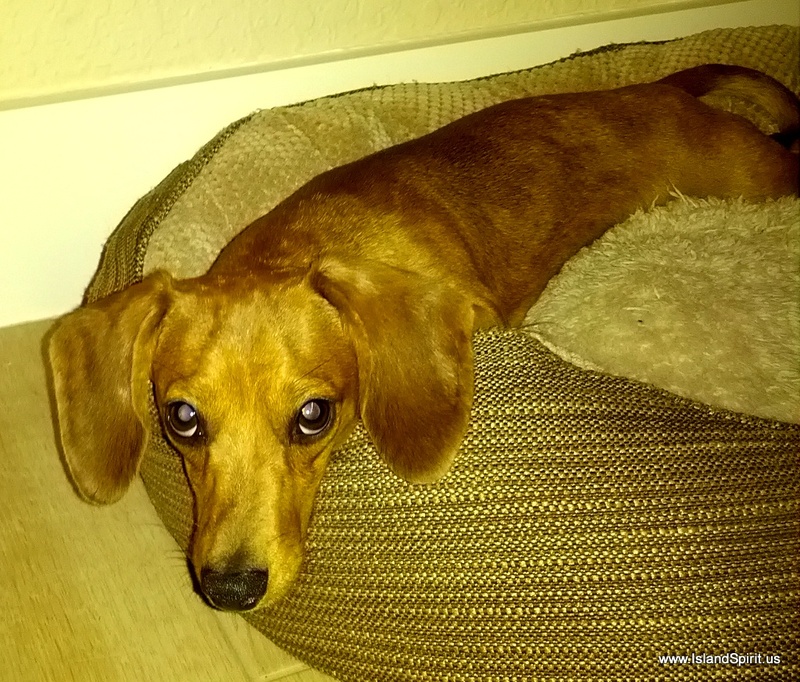 This dachshund is a spunkie lively happy crazy funny dog, and we are always greeted with excitement when we arrive. We have never seen a dog jump and fly like HOLLY can. What a fun dog. Look, here is Radeen holding Holly! WOW, now that is FUN. Hey LUCY and GRACIE….pay no attention to this picture. Aunt Radeen and Uncle Hayden love you two also, but you had to run off to the AZ dessert and leave us behind, so we befriended HOLLY. It is ALWAYS CHRISTMAS when our WASHINGTON family sends in the cookies. Judi always finds us no matter where we are and she always sends us the BEST homemade Christmas cookies. 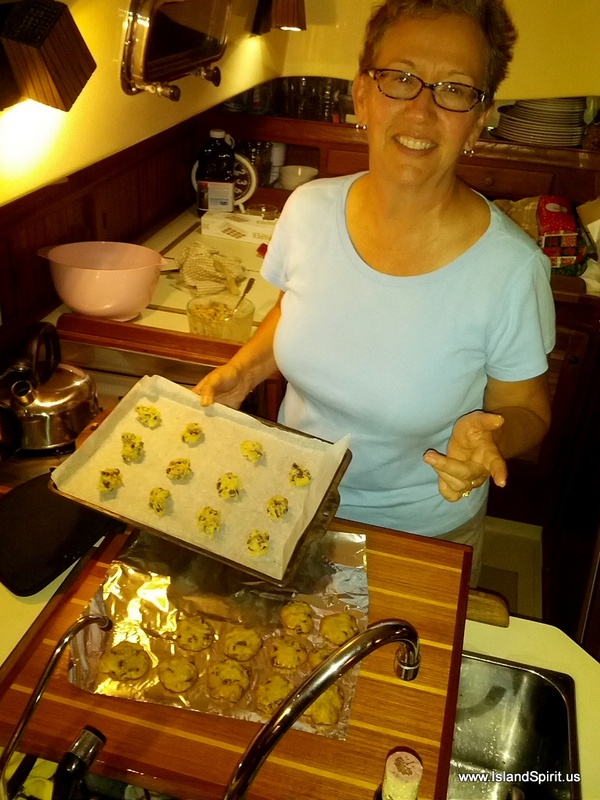 Judi is amazing,and Radeen has the fondest childhood memories of the arrival of Judi’s cookies for the Christmas Season. THANK YOU JUDI. 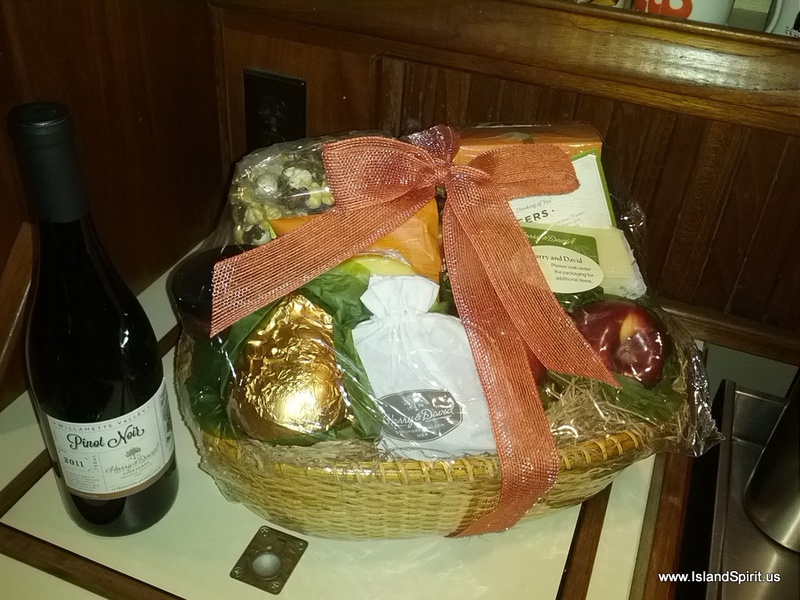 Then we also were surprised by a beautiful Harry and David basket and wonderful Oregon Wine from our Arizona Family, Rhonda and Mike and Tammy and Mark. We will savor these treats all Christmas week long. We miss you all, and will get together soon. 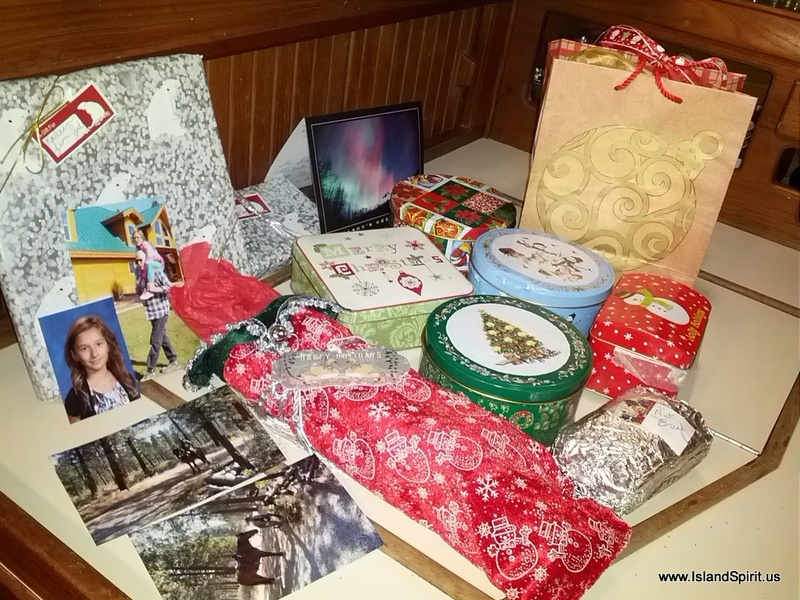 Here are some more random photos of the week…..
We have a CHRISTMAS SQUIRREL! He jumps onto the deck, runs around lookign for treats. 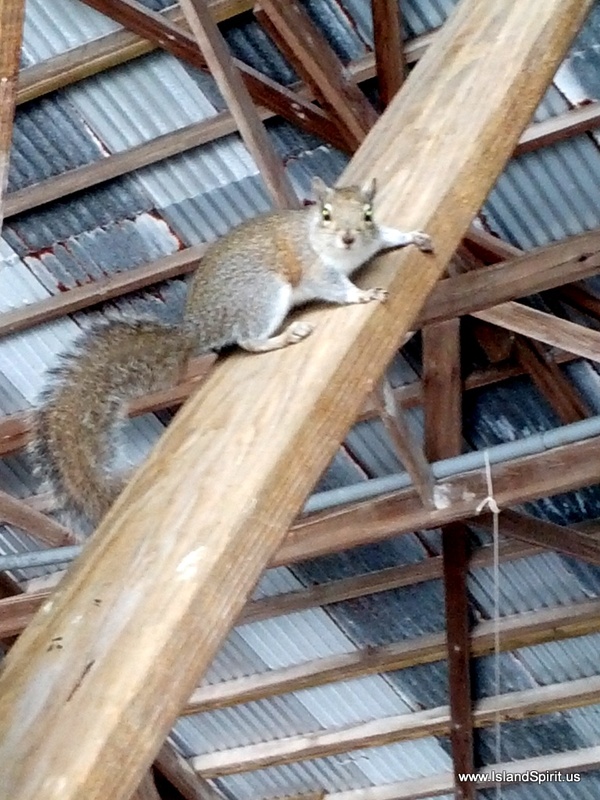 This squirrel is so tame and friendly. I bet I could hand feed him, but have not. So, that is what we are doing here as we look forward to a mast being installed today, if all goes well. If not, oh well, who is in a rush? Not us. We were planning on departing here December 4, one month after launch, but hey, here we are. We have no plans but NOW. The time is NOW and that is how we are living…..
We are still re-building in the shed at Snead Island…. We have been having a great time with local boating friends, Island Packet Dealers, touring the local area, and working on the rebuilding. We are still going through the 650 photos taken at the wedding in Mexico and we will blog about that soon. Right now we are still in the middle of rebuilding this yacht and all the systems we tore apart for trucking. Soon, very soon, we will get the mast installed now that all the rigging is finished. Our B&G Wind Machine is broken and we are waiting for parts on that. If they do not arrive soon, we will raise the mast and climb up later to install the newly repaired wind instrument. 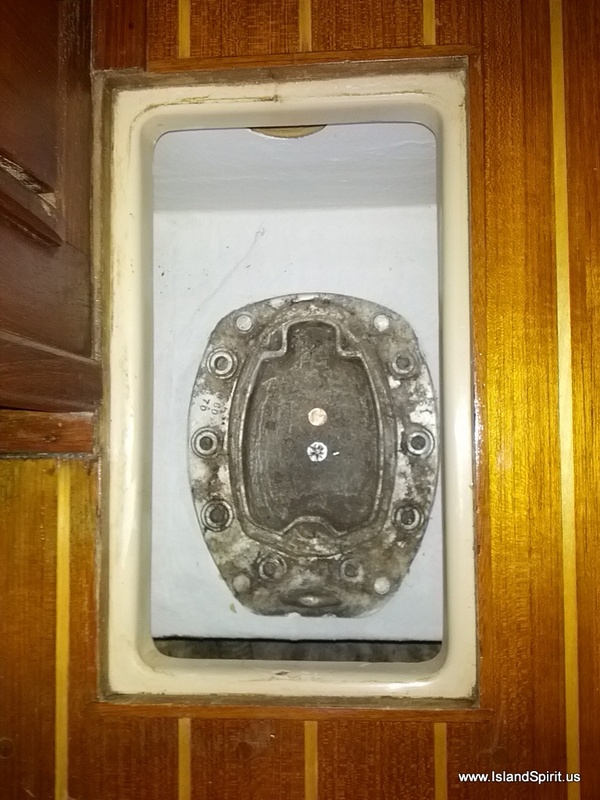 We should have removed it from the boat for transport, bad idea to leave it inside the cabin. 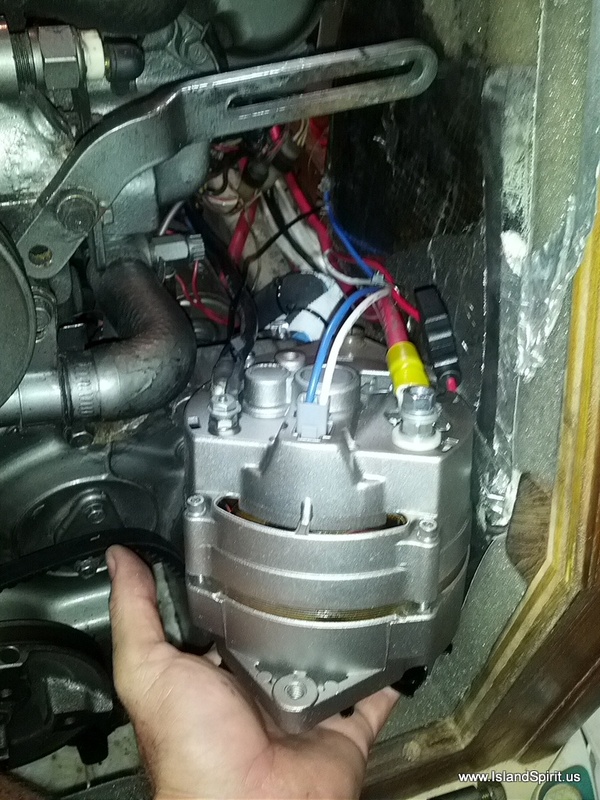 Engine work is nearly completed with oil change and new filters and a rebuilt alternator. 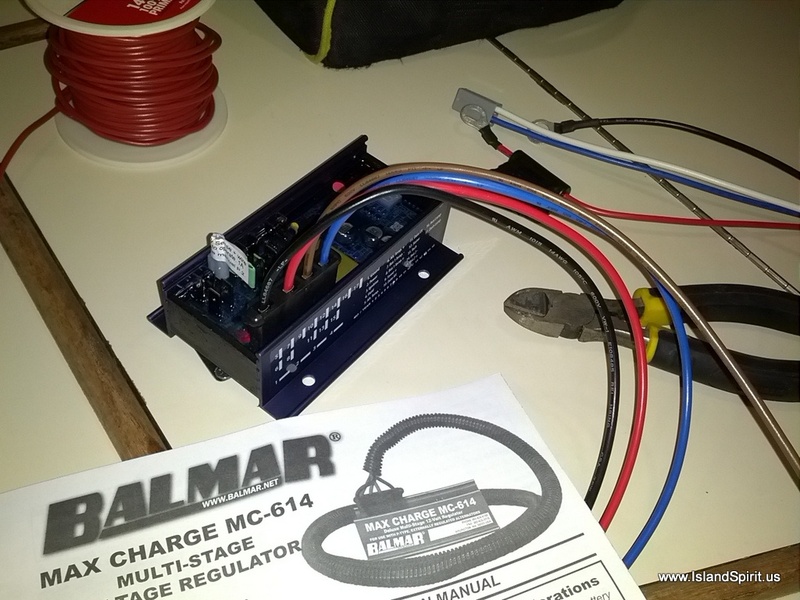 We are now working on a wiring glitch to the regulator, but that should be an easy fix. All the stainless steel rub rails are back on and so is the canvas and enclosure. The solar array has been rewired along with the various antennas. The sails are still below deck and are constantly in the way. The life raft has been repacked and needs to be picked up in St. Pete along with one boat buck$ for the service! 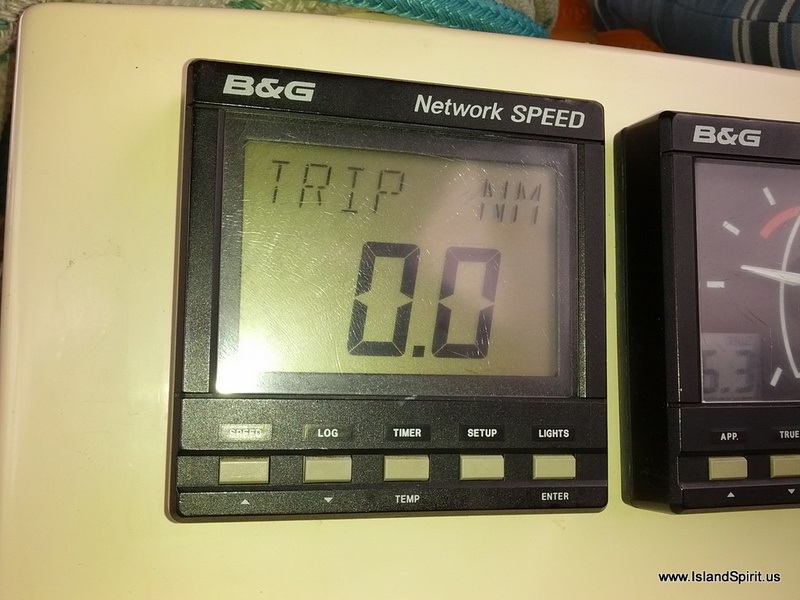 The onboard network needs rebuilt and installed and we need to reset up the WiFi Bullet2hp rig. The stereo / DVD player died during trucking and needs to be replaced. We are shopping for a similar unit that will play DVDs, iPod, CDs, and Aux in for Satellite Radio. If you have any ideas, please comment and help out. 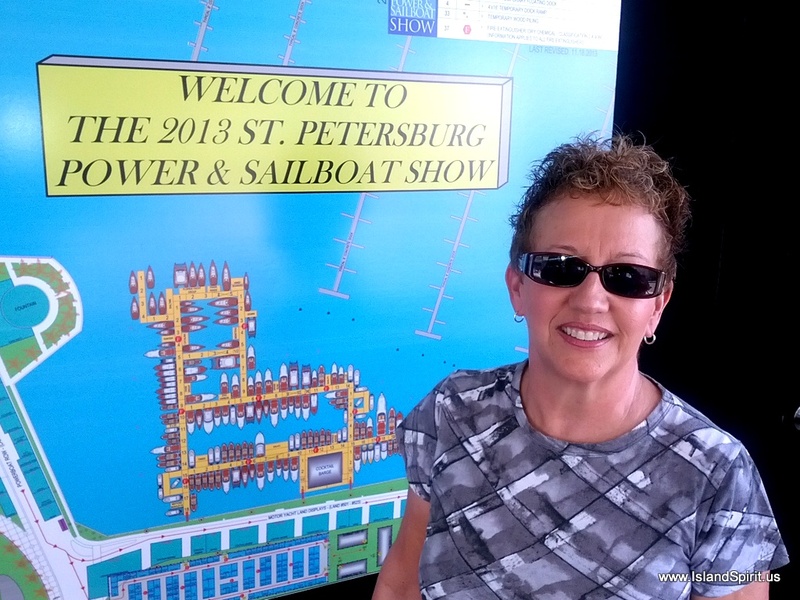 We had a great time at the St. Pete BoatShow as we were invited to be guests of the new Island Packet Yachts Legacy Dealer here in the area. 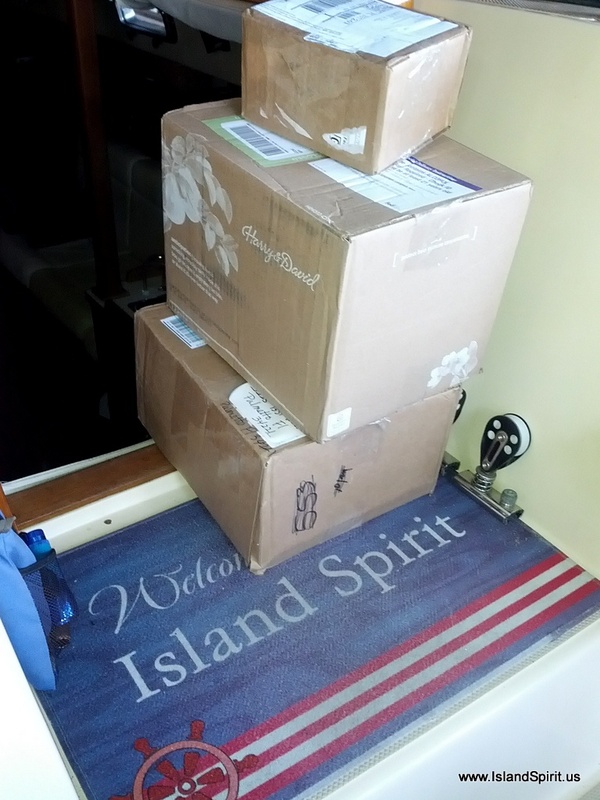 Whiteaker Yacht Sales has been named the new Island Packet Dealer for all of Florida and up to the Carolinas and more! 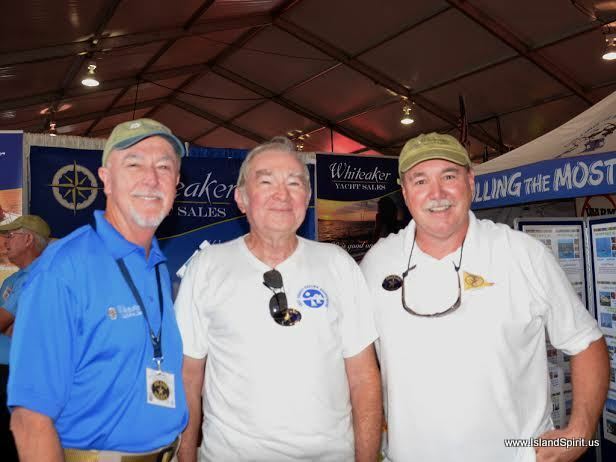 Radeen and I were invited to spend a day with them at their booth and talk to IP owners and guests about sailing and cruising. WOW, that was really fun and we met several new IP owners. What a fun time and a gracious gesture by Ed and Debbie Whiteaker. We toured the show on Thursday and then we were with them all day Saturday. Thank you, we loved it! Looking ahead this week, we are still hoping to get the mast installed, and then get some sails on and finish the wiring to the mast. Here are some great photos of the week. Alan and Kathy of IP 420 Flatlander. Here are the girls in the beautiful kitchen. 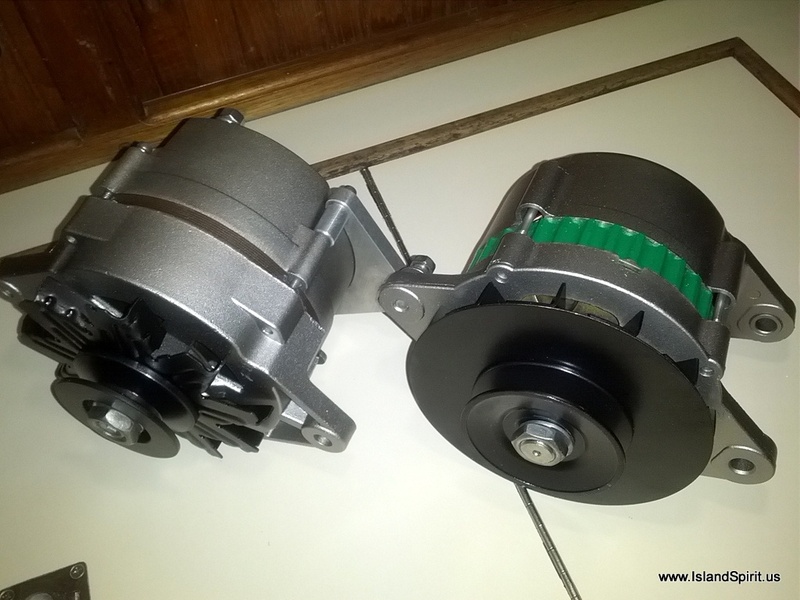 Our alternators rebuilt by B & E Electronics in Palmetto. Great job! 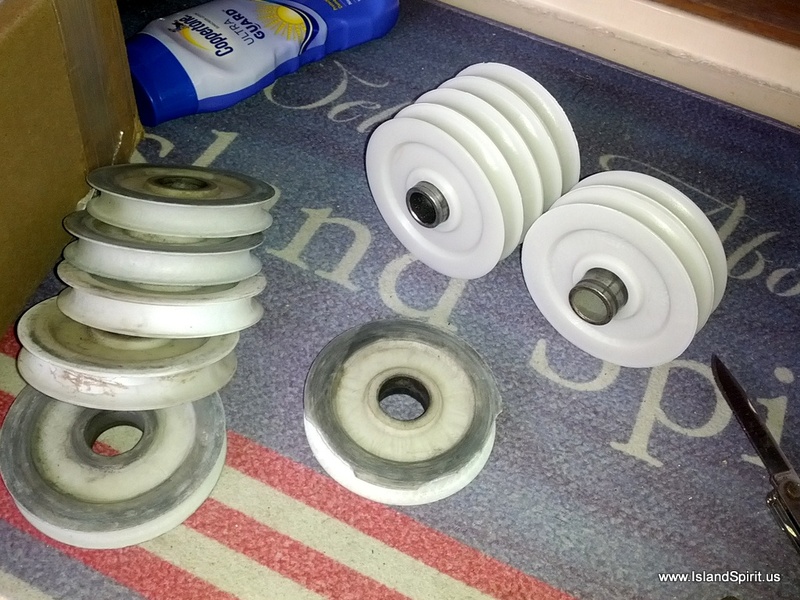 Now my spare will be onboard and not home in the garage! What do we do with this on a sailboat? Toss it overboard? 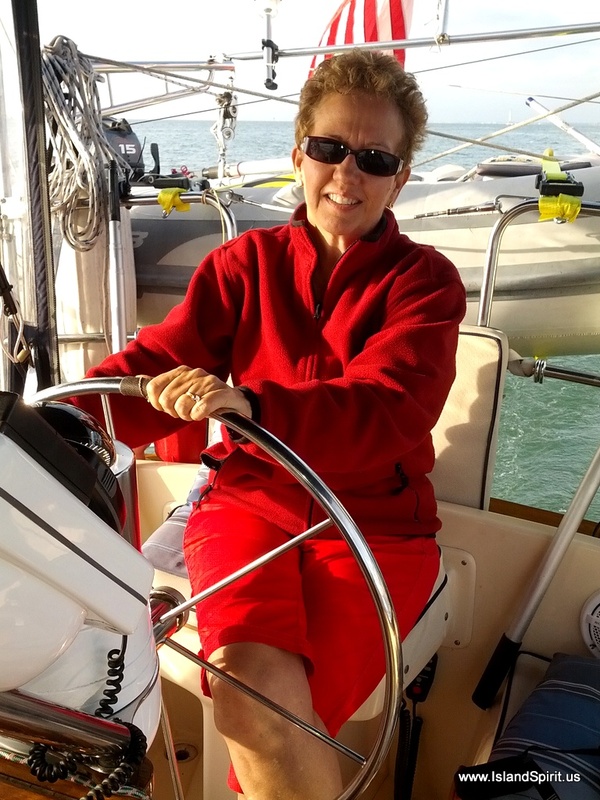 Radeen, ocean sailor Girl…..if we ever get a mast installed. I need to get the work done and motor out of this barn! So there we are. Still working on da boat. Still rebuilding. The great aspect is that, as we said before, we have no schedule, no place to be but here, and no plans except whatever we do today. This is a great way to live, and we are loving it…. Thanks for following, please leave us comments, we enjoy hearing from our readers. Image of the 100,000th pageview…. We have a winner of the 100,000th Pageview Contest! 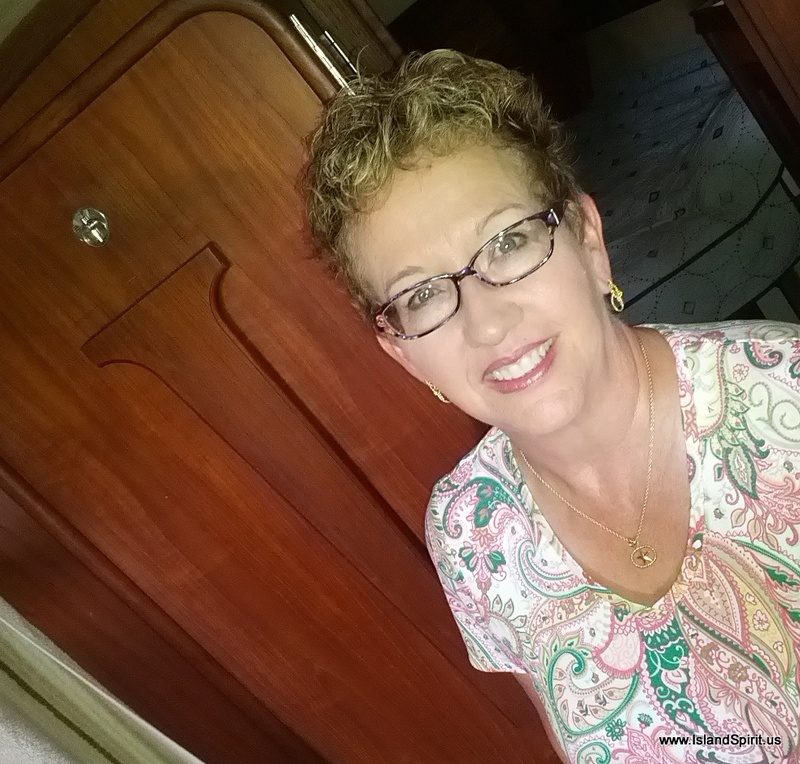 Congrats to the proud former owner of IP-350 Eileen, #1 Golden Doodle Master, RV Road Warrior, and very good friend, Greg, who captured the exact moment of the 100,000th pageview of this blog. 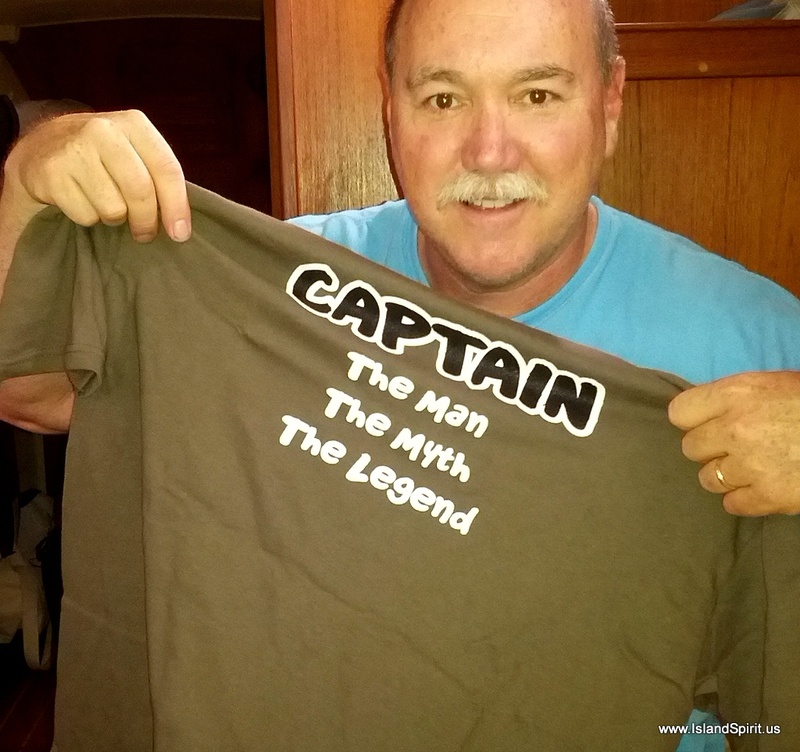 Thank you to Greg for participating in and winning this world wide contest :-). Your calendar or T-shirt will be in the mail shortly. 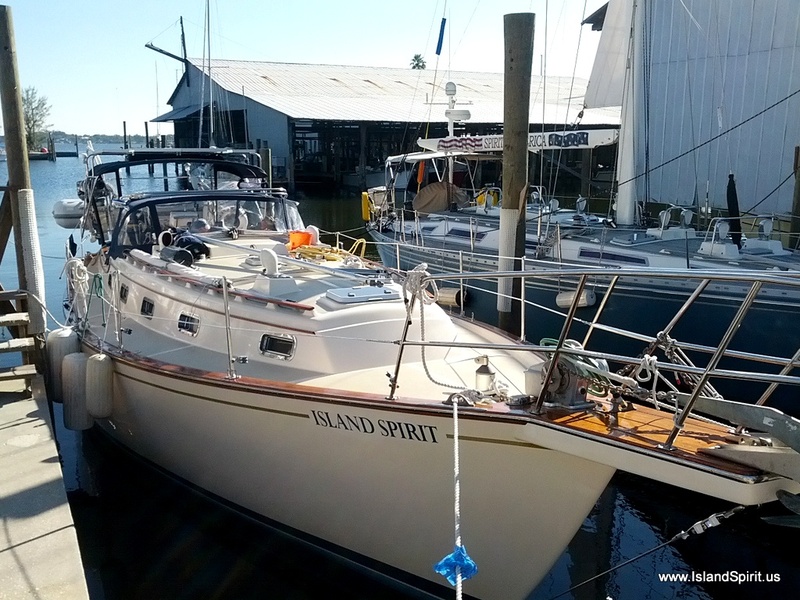 As for Island Spirit, she is progressing slowly. Some of this slowness was due to diverting to Playa del Carmen, Mexico, where Radeen and I enjoyed the beautiful wedding of Julia and Brain. Julia is the daughter of Anita and Mark, our good college friends of nearly 40 years. We were so happy to be included in this very special event. 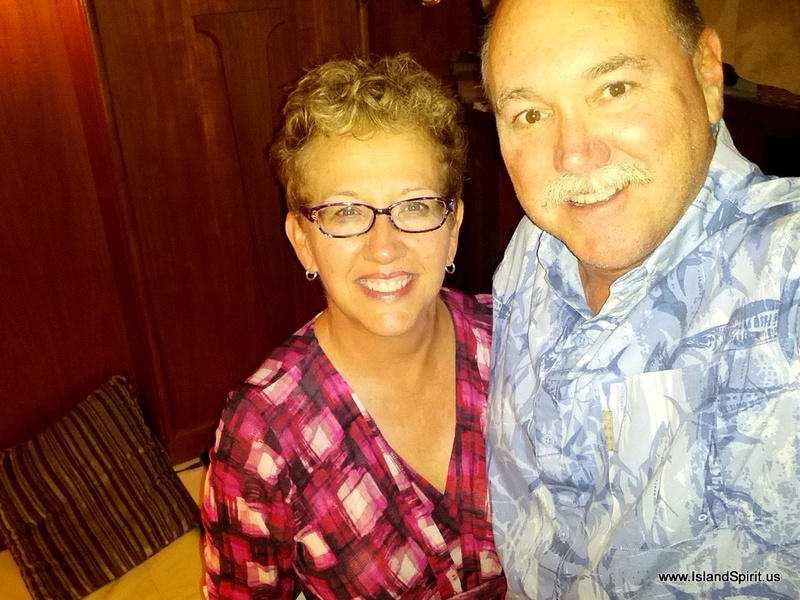 The Azul Fives resort was gorgeous and we enjoyed five days there, celebrating with their family and friends. More details to follow! 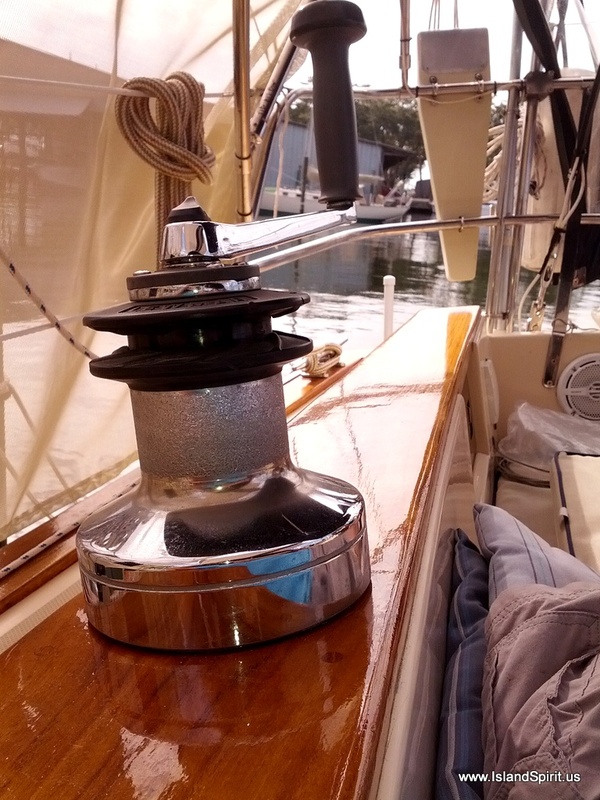 So, now we are back aboard and working on the mast rigging and cleaning and stowing every thing. Someday soon, we will be back to where we started, that being with a fully working perfect IP 35, just like we had in May when we ripped it all apart and trucked it to the factory! Then, maybe then, we can move on and get cruising! Overall, we do not yet see the light at the end of the tunnel. We are simply working one day at a time, with no real schedule and no real place to be but here. 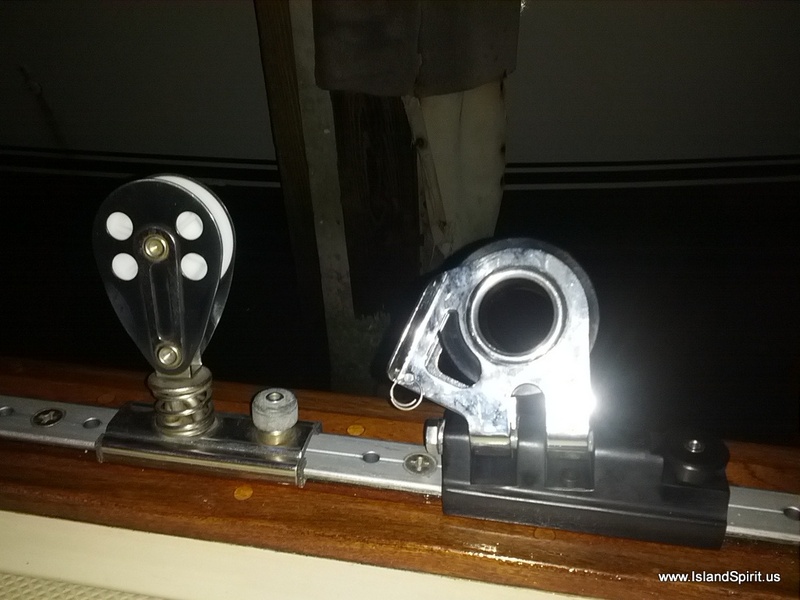 Such is life on a cruising sailboat.